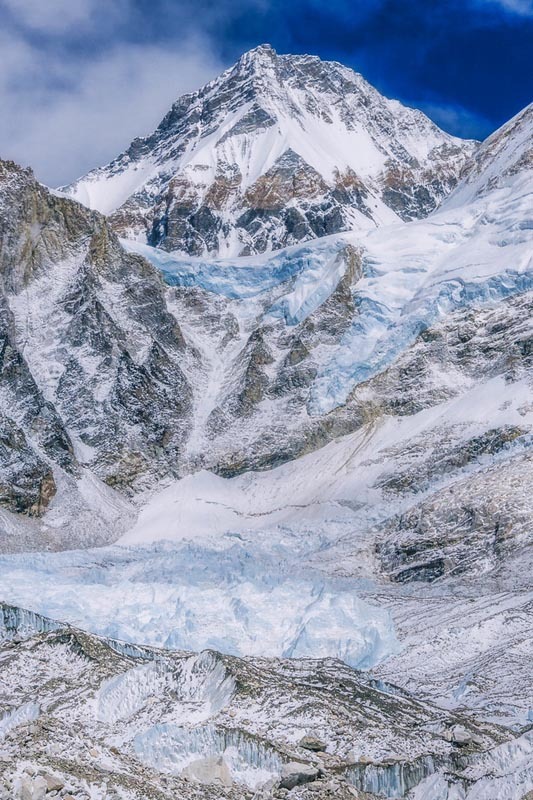 What is it like to do the Everest Base Camp Trek? It's amazing, it's exciting and it's exhausting. 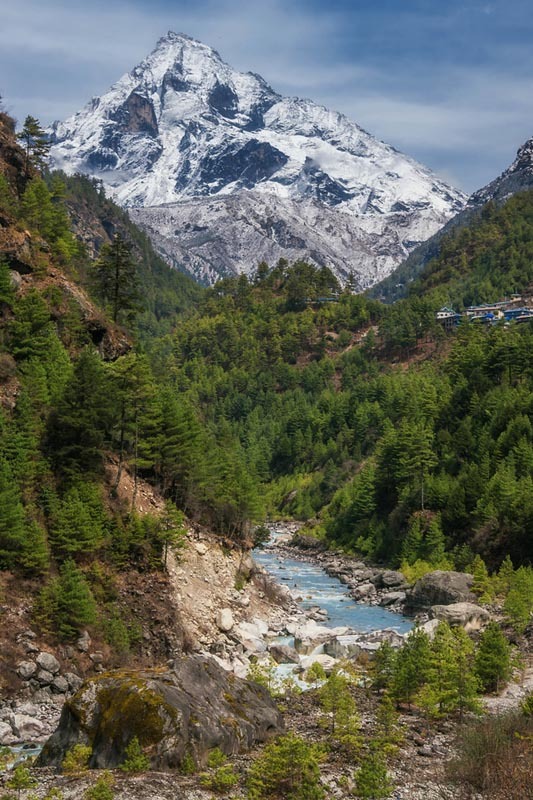 We share everything you need to know from planning, packing and what it's like on the trail through Nepal's legendary Sagarmatha National Park. 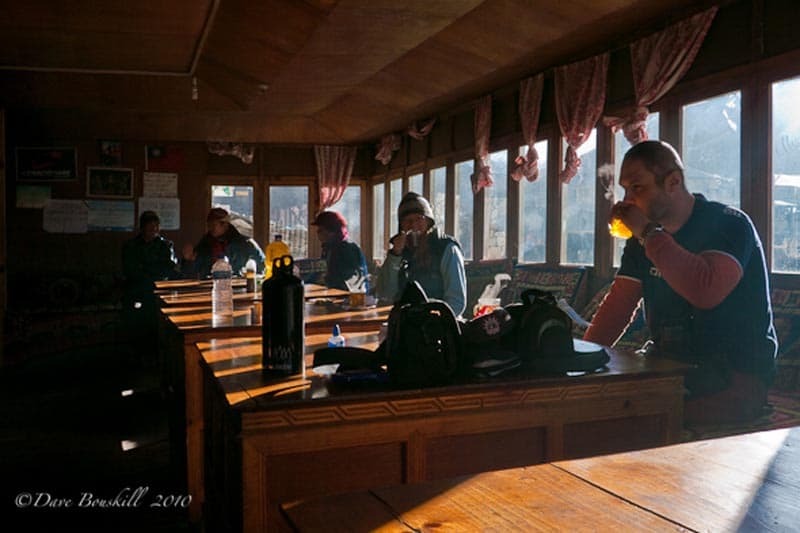 Base Camp Trekking is a tea house trek. 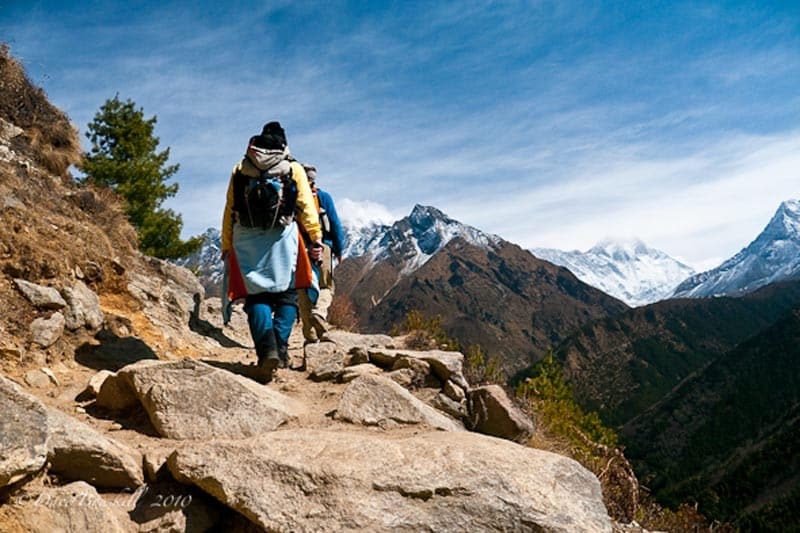 Nowhere else on earth will you find trekking as you do in Nepal. Villages dot the landscape filled with hotels, restaurants, and tea houses where you can stop for lunch, buy supplies, and have some apple pie. When trekking Everest, you don't stay in tents. You stay in guesthouses built along the route, known as teahouses. 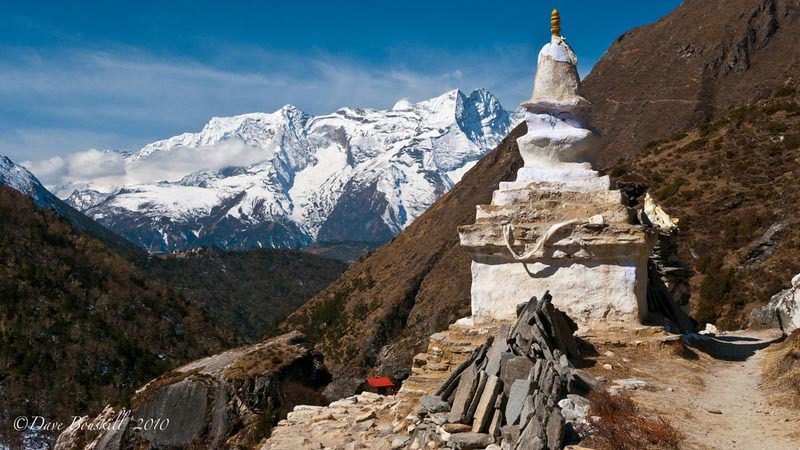 To book a Trek to Everest Base Camp, visit Simrik Nepal Treks. Dipendra is native to Nepal and was our guide to Everest base camp and has since opened his own company. Should you hire a guide to EBC? It took us 8 days to reach Everest Base Camp to view the Khumbu Icefall. 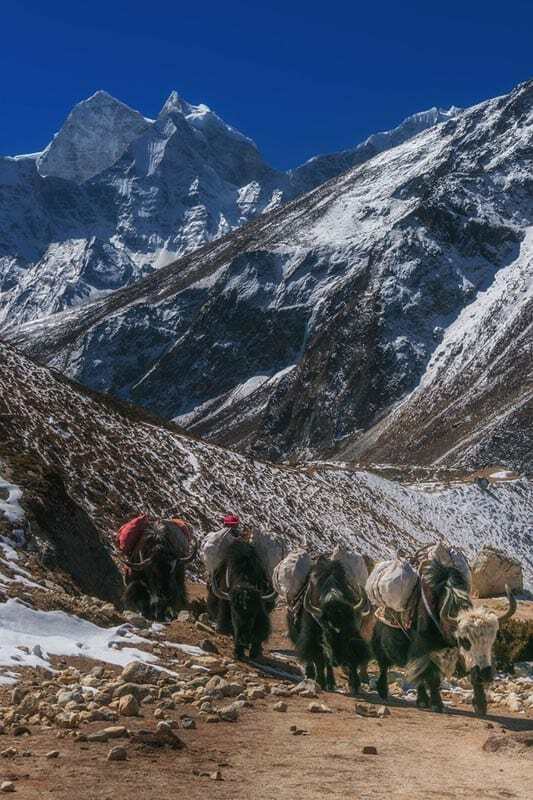 On the map, the Everest Base Camp trek distances look fairly easy from village to village. With eight days to cover approximately 68km, it seems like you would have no problem. Even though it is a gradual elevation gain over several days, the trek difficult because there are several days of trekking above 4000 meters. (12,000 feet). Flying into Lukla takes you immediately to an elevation of 2,845 m (9,334 ft) so you will start off the hike feeling the effects of altitude. Throughout the trek, there is a total elevation gain of 4500 meters (14,763 feet) with more than 2000 meters lost. That's a lot of up and down making for an exhausting yet fulfilling trip. We recommend being in good shape with some altitude experience before tackling base camp. It's good to know how your body reacts to that height. 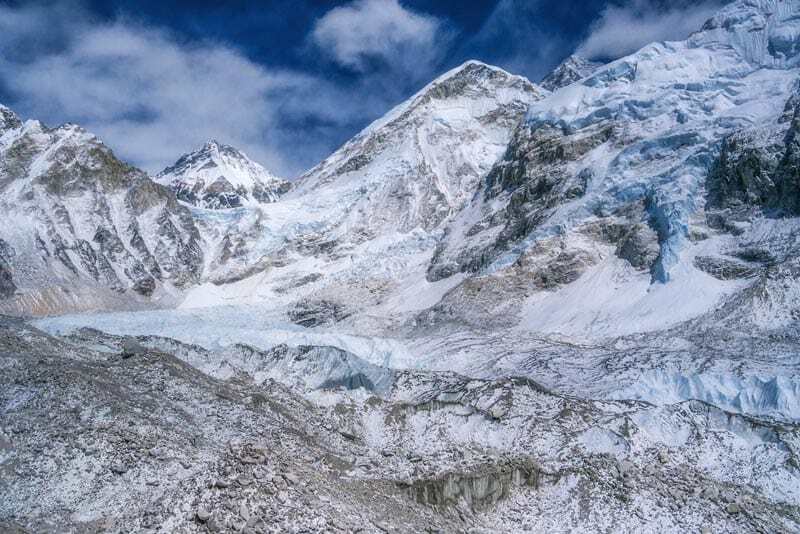 Mt Everest Base Camp's elevation is 5,380 m (17,600 ft). You will hike out from Gorakshep and then hike back the same day to spend the night. Many people plan on hiking on afterward to the Gokyo Lakes trek and we did too. Unfortunately, I became quite congested after returning to Gorak Shep, so we decided to return to Lukla instead of climbing on. We always travel with travel and medical insurance but hiking to Everest Base Camp will not be covered by regular insurance providers. There is a very real possibility of altitude sickness and we knew of two people that needed helicopter rescues during our trek. 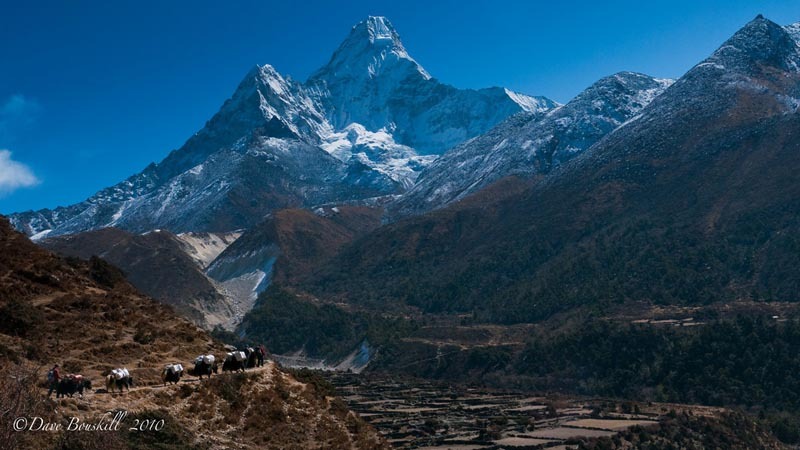 World Nomads offers specific Everest Base Camp Insurance. You can check them out to get a quote. 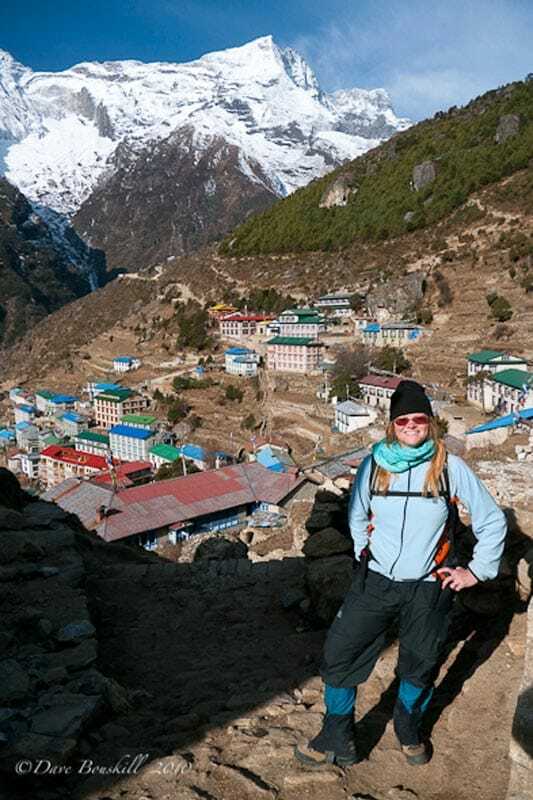 Layering is extremely important when trekking to Everest Base Camp. This is a quick guide for clothing but we wrote a complete packing guide here of everything we packed for our EBC Trek. 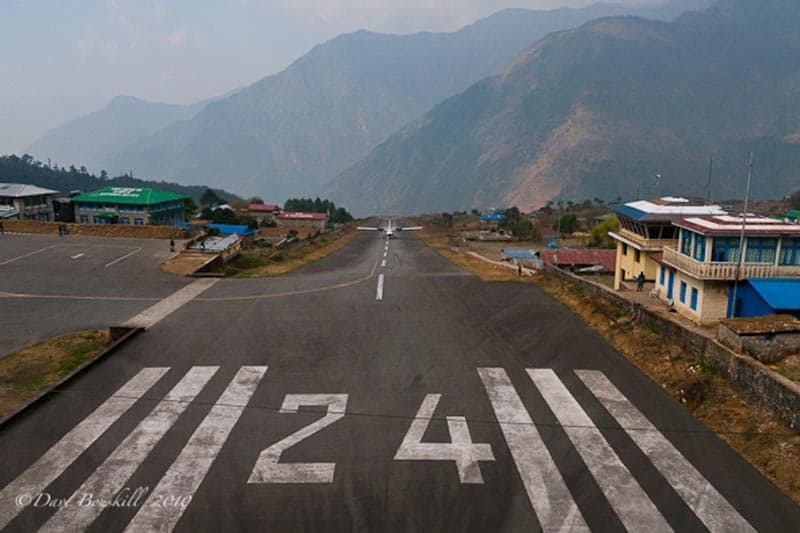 The Tenzing-Hillary airport stands at an altitude of 2800 meters in the middle of the Himalayas. 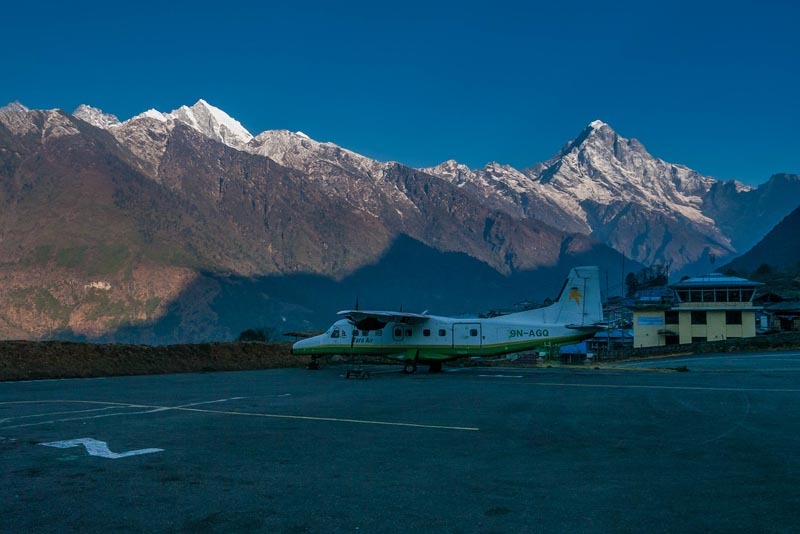 The flight from Kathmandu is an hour-long scenic thrill ride through the Himalayas, landing in the village Lukla where the Everest base camp trek begins. It is a short landing strip built at a steep grade to slow the planes down quickly. The steep grade is needed because if you don't stop, you are going straight into a mountain. It is not the landing I was nervous about as much as having to take off in 2 weeks time. It looks terrifying, but I don't have to think about that for a while. We had just taken our thrill ride of a lifetime and were only at the beginning of our adventure of a lifetime! There was no time to stop and think about it though. 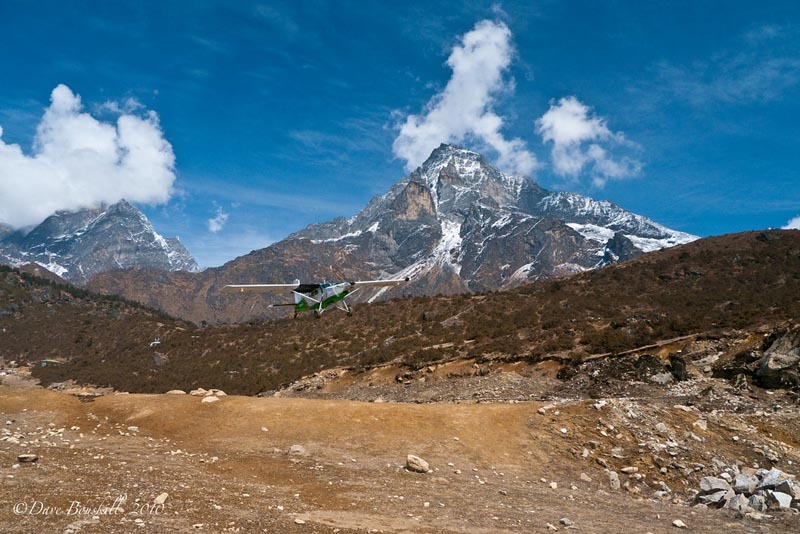 Once we landed, we had to trek for 3 hours from Lukla to Phakding. So, after a quick breakfast, we were off. We had been awake since 4:00 am. It is awe inspiring to be surrounded by the Himalayas. 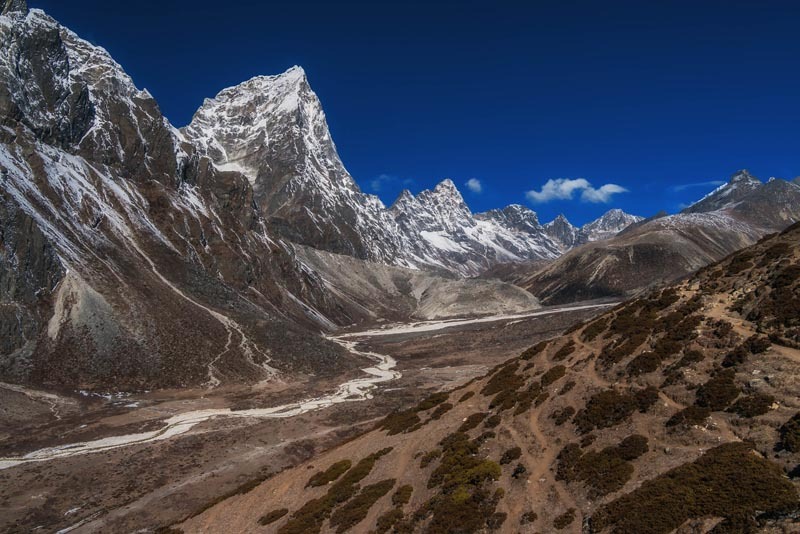 The hike to Everest Base Camp takes us through the Sagarmatha National Park, a UNESCO World Heritage Site since 1976. At 1148 sqare km (443 square miles) the park is one of the most awe-inspiring places we have ever visited. 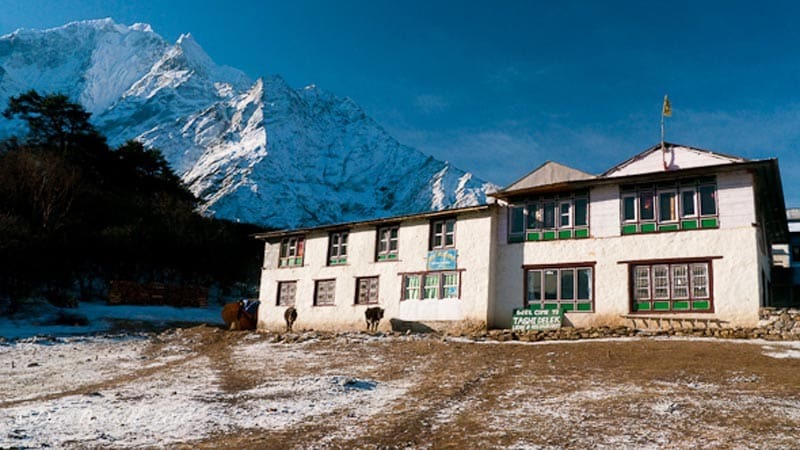 Like any national park around the world, we needed a permit to enter, and we had to check in with the park headquarters to be able to hike to Everest Base Camp. Our guide Dipendra (aka Deep) had that all in order, so all we had to do was start walking. When leaving Lukla, Deep pointed out jagged white peaks named Kwangde, Mumbu, and Kishumkongara. At 6000+ meters, (18,000 feet) these are the “little guys” of the world's highest mountain range. We decided to hire a guide and porter for our Everest Base Camp trek. Several days are spent above 5000 meters. You can trek the region yourself carrying your own packs and gear, but you have a much better chance of making it if you hire guides. We also made new friends in Dipendra (Deep) and Sher, and learned a lot about local customs and tradition. 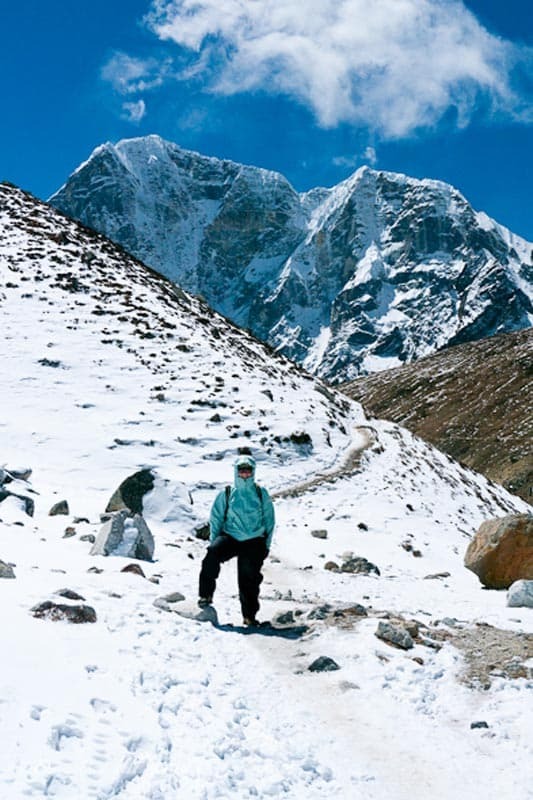 Deep has more than a decade of guiding experience and knows most people along the trek, and Sher grew up in the Everest region. Having Deep explain things to us not only made our Everest base camp trek an adventure, it also helped us understand the spirituality of the people. Everest nurtures and provides for the community. They respect the mountain and keep traditions alive. Before starting the trek, we learned of the meaning of the prayer wheels and prayer rocks. Walking to the right of the prayer rocks keeps you on the right hand of God. They spin prayer wheels saying the mantra Om Mani Padme hum giving blessings to the climb ahead. 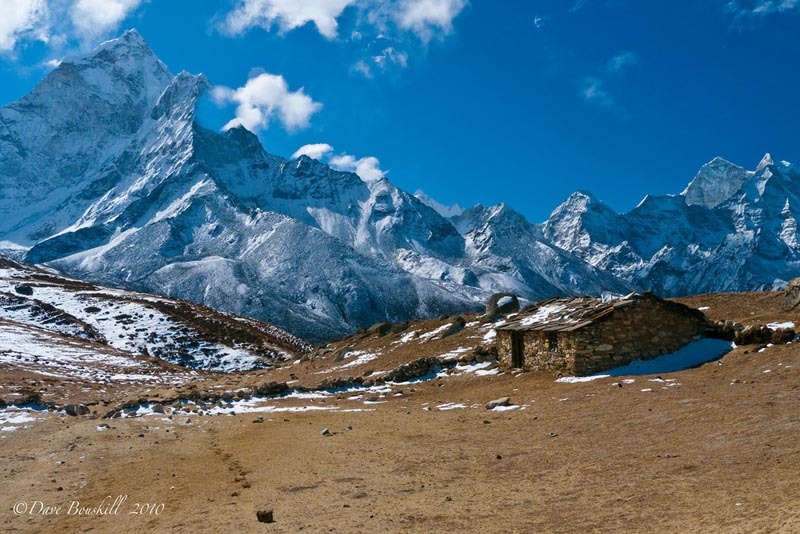 The villages of the EBC Trek are picturesque. They remind us of something we would see in the Swiss Alps. Cozy lodges and brick homes line the trail with the magnificent setting of the Himalayas draped in back. It is a society that seems to be thriving. Dipendra (our guide) says that life is good here in the Everest Region. People do well here and they respect the tourists because the tourists are what keeps them going. Towns function well up here in the mountains. 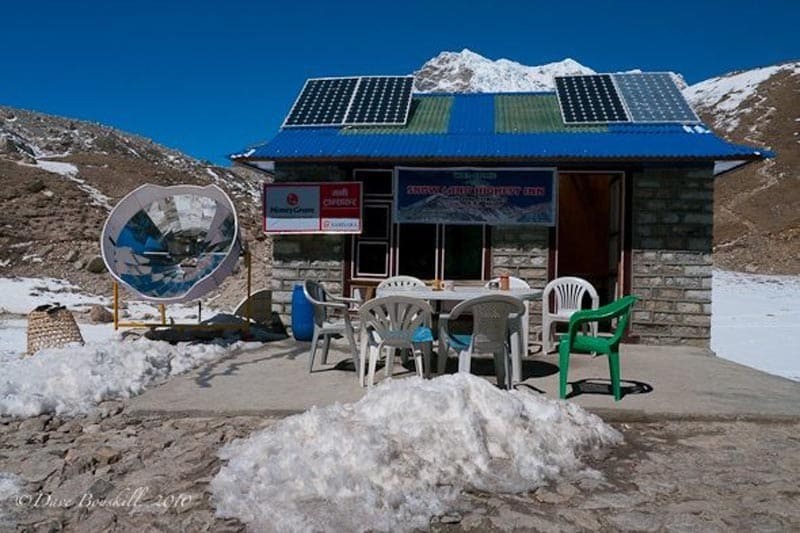 There is electricity from the water that they harnessed from the mountains, and they have solar power for electricity, schools, water, televisions, and bars. That is not to say that things are easy. All supplies, food and equipment need to be carried in by foot. They live in harsh conditions. 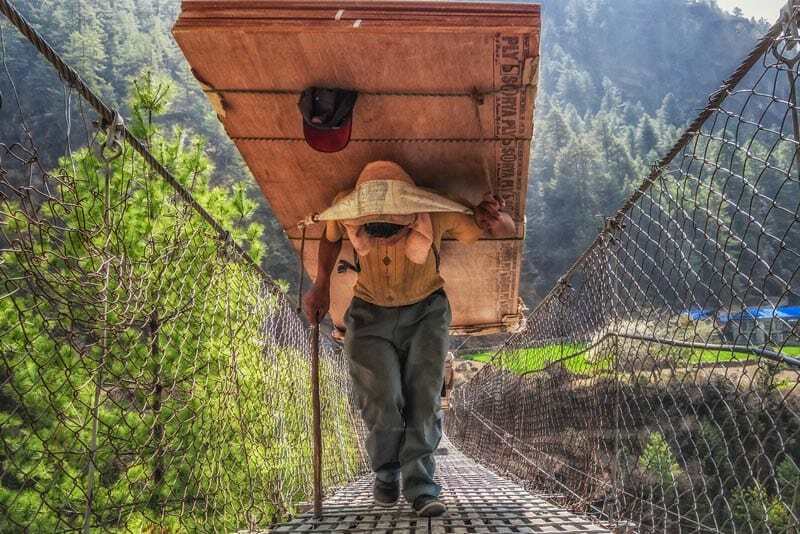 Porters carry heavy loads on their backs. Children and women also carry loads. People herd Yak trains with loaded propane and kerosene. Just walking the steep stairs in villages is difficult for us. 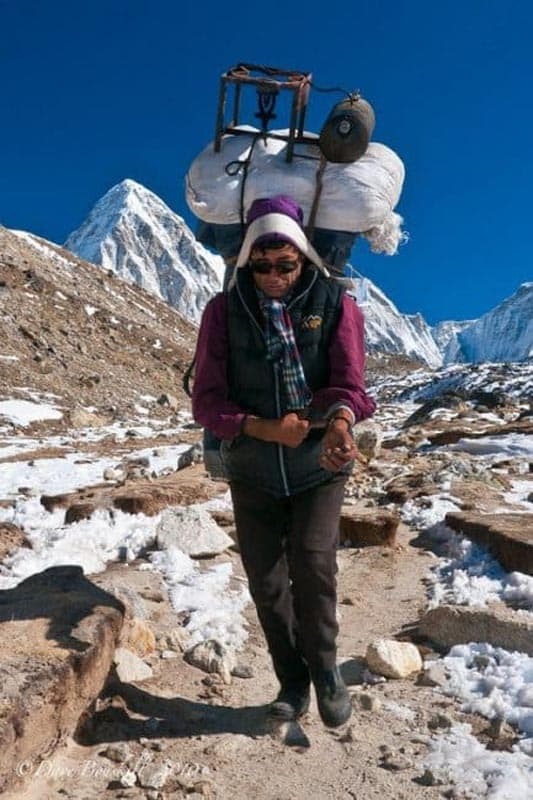 Dipendra tells us that Sherpa's can carry up to 100kg. We see men carrying stacks of plywood with heavy white sacks loaded on top. 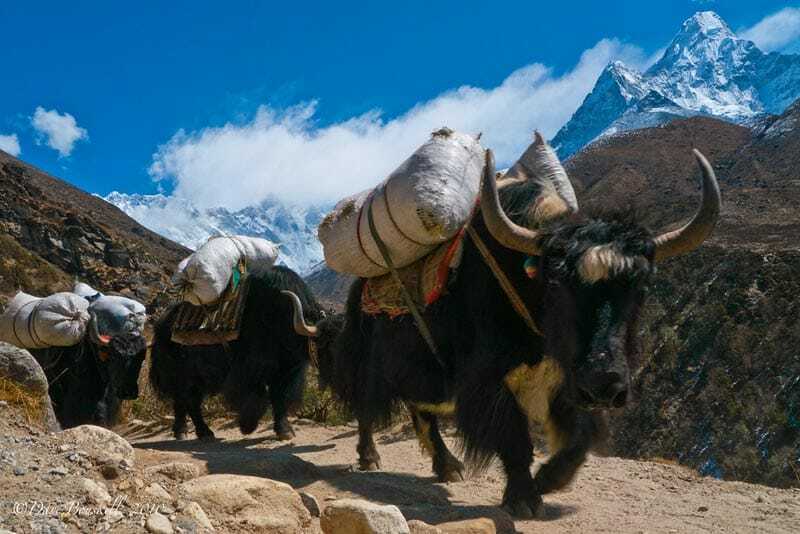 The trail to Everest Base Camp is a highway, but instead of transport trucks carrying cargo, people and farm animals carry everything from lumber and building supplies to food and kitchen appliances. The Nepalese are a strong bunch. They smile and say Namaste (hello) and they talk on their cell phones and listen to music. All this while climbing uphill towards the tallest mountain in the world with giant over-sized loads on their backs. During our Mount Kilimanjaro climb, porters had a limit of 35kg. 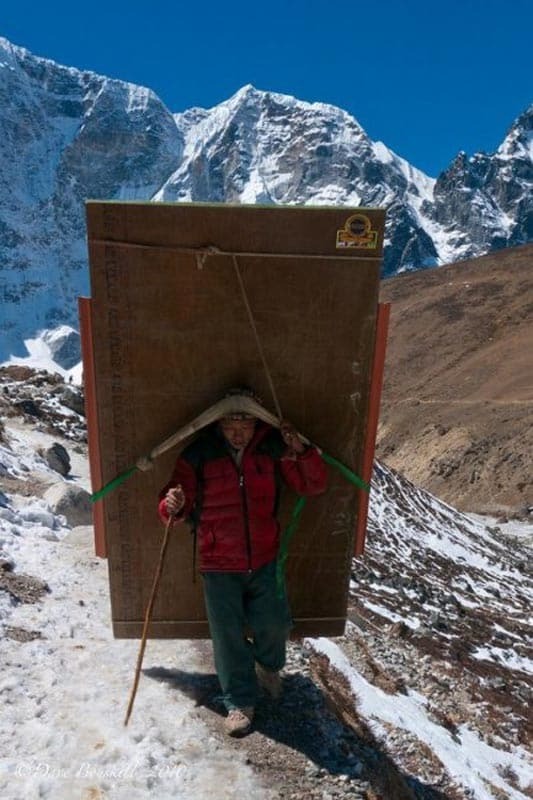 A far safer and more acceptable weight than the up to 100 kg that Sherpas carry. We are thrilled when we reach our first night's accommodation. It's a quaint little hotel/tea house that looks like a cottage. The wood burning stove smells delicious as it warms the restaurant. After an early dinner, we retire to our clean room where we sleep like rocks snuggled up in our thick down sleeping bags. Our first day at Everest has come to an end and we spend the night at 2400 meters listening to the rain fall outside. 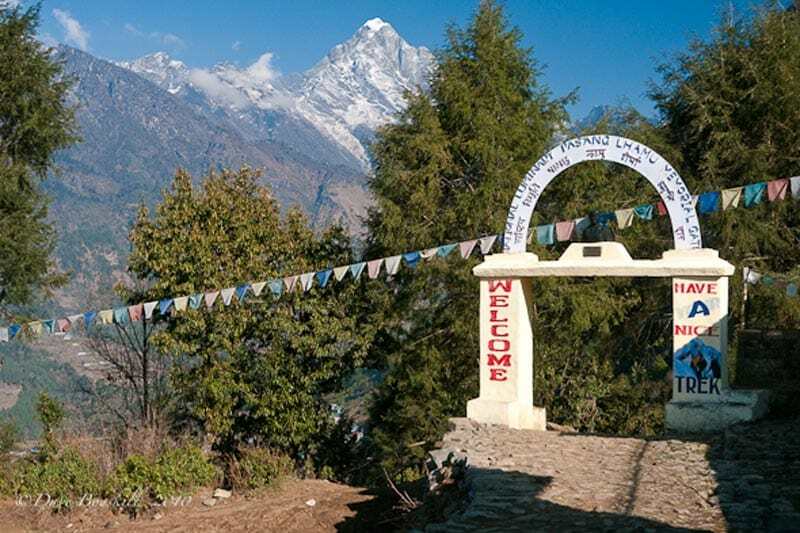 After checking into the park headquarters, we were officially in the Khumbu Region and on our way to Everest Base Camp. Day two of our Everest Base Camp Trek was the longest day of our trek. 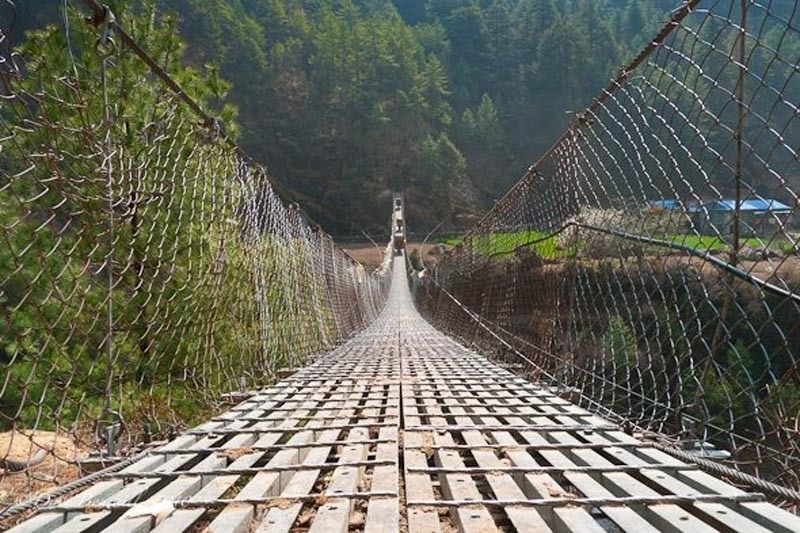 It is a lot of fun though because you cross several suspension bridges. 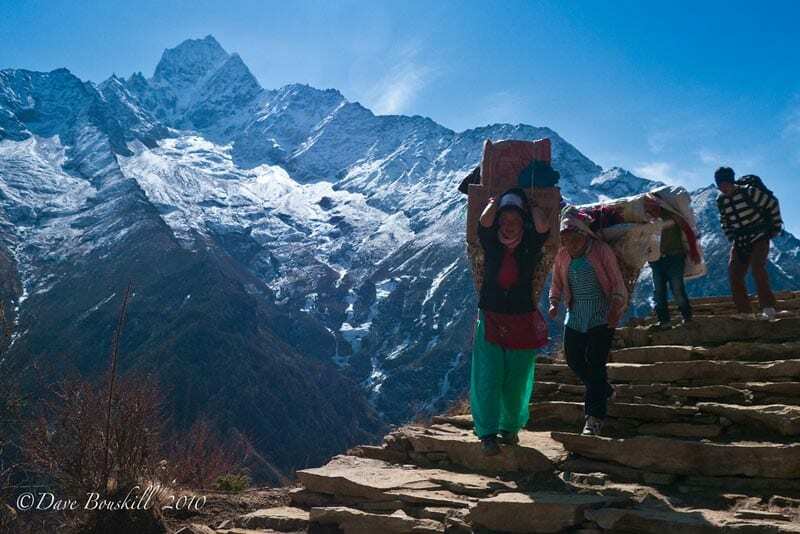 You get to challenge yourself by trekking up some steep mountains and you see a lot of donkeys, cows, and goats on the trails taking supplies to Namche Bazaar. Traffic can get very heavy on the trek. When yaks or donkey trains go by, you have to make sure to get out of their way and stay to the side. These animals don't stop for anything. They are loaded down with heavy gear, they have a long walk each day, and if they nudge you off the side of a cliff while barrelling by, well, that is your problem. While hiking over hills and valleys, we experienced some thrilling moments, especially in crossing several suspension bridges dangling over deep gorges. If you have a fear of heights, this may not be your favorite moment, but the bridges are well constructed and in excellent condition. I was nervous about the suspension bridges. The Lonely Planet says “Grit your teeth and climb onto a drooping suspension bridge floating at a dizzying height.” That sentence freaked me out. I had it built up in my head as something monstrous. But by the time we reached the bridge, I wondered what all the fuss was about? Dave, of course, isn't afraid of anything, (which drives me absolutely crazy!) so he was already looking forward to the bridges. Once I crossed my first bridge, my confidence was up and I was ready for anything. The last push of the day consists of 2 Hours straight up to Namche Bazaar. We were drenched with sweat but the air was cool. Whenever we stopped for a break, we would get a chill so we just kept on chugging away. Groups pass us quickly, only to be caught a few minutes later as they rest. We realize that we were the tortoise and they were the hare. Slow and steady is the way to climb to Everest Base Camp. Altitude can kill. We didn't take this lightly and refused to hurry our pace. By the time we reached Namche Bazaar, we felt great at 3440 meters. We checked into the security post and cringed when we found out that our lodge was uphill another 20 minutes. Rest had to wait a bit longer. When we arrived at our accommodation, Camp de Base, we were thrilled to see our porter Sher's smiling face. He had already checked us in and put our bag in our room. All we had to do was get out of our sweaty clothes and climb into our cozy sleeping bags to take a nap. We had two glorious days at Namche Bazaar. One to rest, one to acclimate. 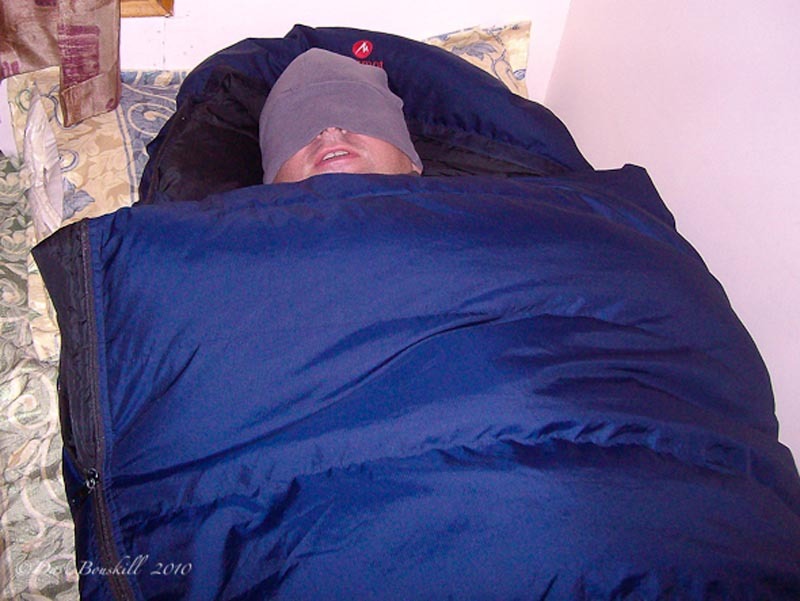 Most high altitude treks have at least one acclimation day. 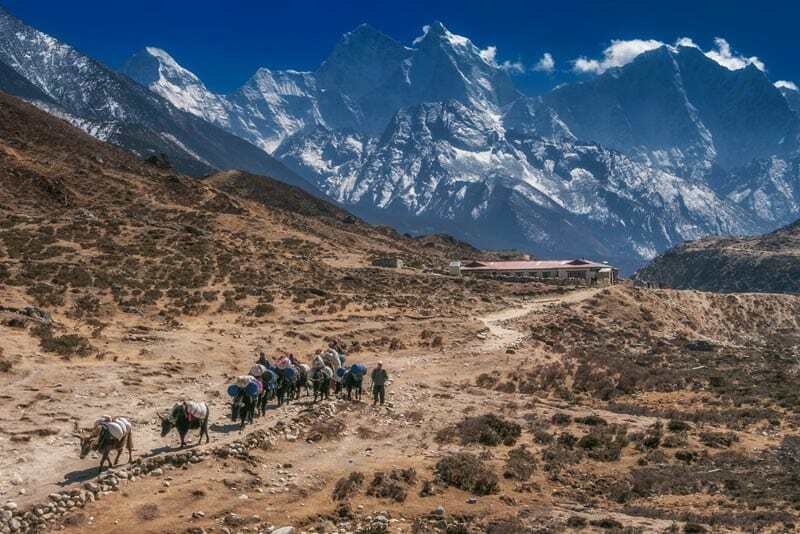 The Everest Base Camp trek is no exception. It gives your body a chance to adjust to the altitude. If you are not feeling well, it is a good day to relax. If all is well, you can do some treks like Dave and I did. We got to see our first glimpse of Mount Everest. Our hike started at 8:30 am to see the Everest Viewpoint from Namche Bazaar. It is not an easy day off. Just walking through town takes your breath away. As we made our way up the steps, I wondered if I should have just stayed in bed and skipped the viewpoint. Children run and play and porters carry heavy loads with ease, but we (especially me) were breathing heavy just walking up the steps. We hadn't even left Namche Bazaar and I was pooped! Once we got on the trail, things became easier. The steep steps gave way to a sloping trail and I started to feel better. The Views of the day! After one and a half hours of climbing, we reached what has to be the world's highest airstrip at 3700 meters (12,139 feet). We arrive just in time to see a small plane take off. The pilots have a short runway filled with rocks ending with a vertical drop into the abyss. The plane doesn't need much room though, it is airborne before it even reaches the middle of the airstrip. It flew right over our heads into the valley surrounded by jagged rocky peaks. We hiked a bit farther and there it was: Mount Everest, standing quietly behind the other mammoth peaks of the earth. 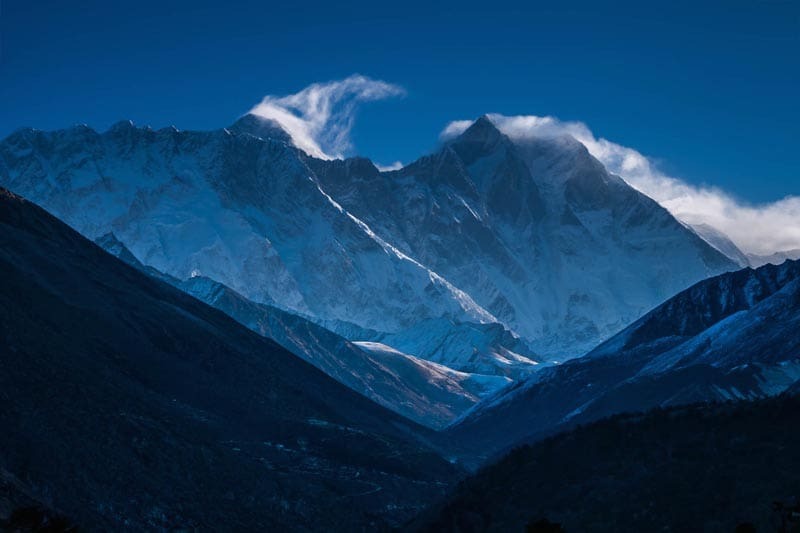 Lhotse, Changri, and Nuptse surround the highest mountain in the world. At 8414m, 6027m, and 7861m they are the little sisters to the mighty Mount Everest. Everest stands at 8848 meters. The deep valley views were magnificent. The river wove far below, carving through the panorama of white peaks. We walked a narrow trail snaking along the side of a steep mountain and suddenly realize the trek has become real. 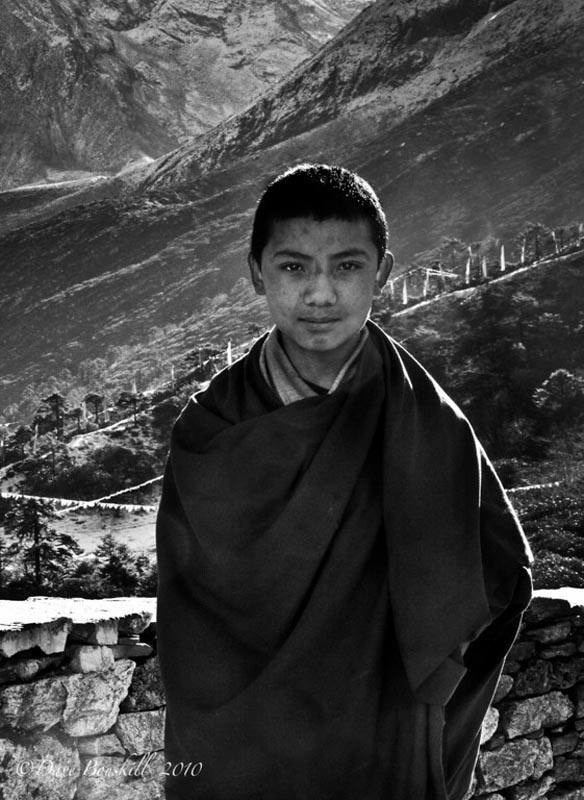 We were high in the Himalayas and one false move could mean catastrophe. The sky was a deep blue and the white peaks reached towards the billowing clouds. The earth shows off her glory and we suddenly felt insignificant. These mountains have lasted an eternity. They are the lords of the land and we are merely visitors. You feel as if you could reach out and touch heaven. The clouds rolled in quickly so it was time to go. 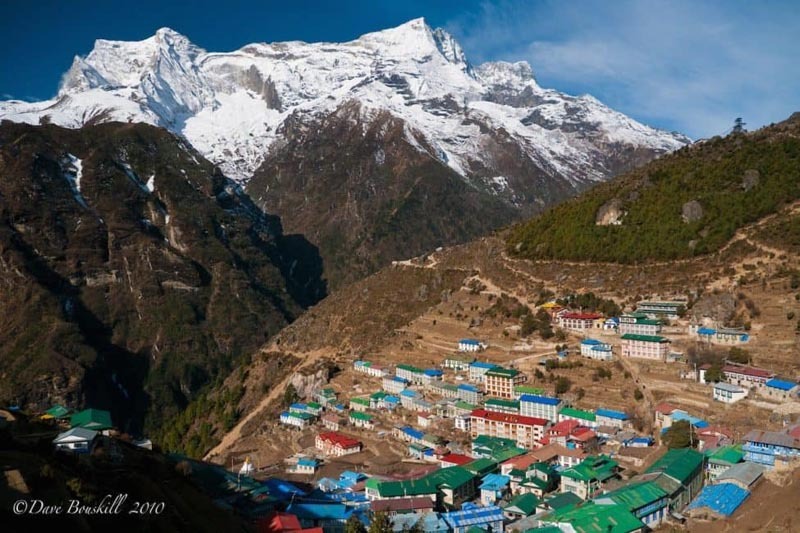 We went back to Namche Bazaar with visions of Everest in our heads. The rest of the day was spent relaxing, reading and eating chocolate. We explored Namche Bazaar and checked out its many shops. The Everest Bakery was a highlight with delicious apple pie, fresh coffee, and wifi. We already saw a woman suffering from Altitude sickness. She had her blood pressure taken and heart rate monitored. When we walked back to our guest house we saw her staggering as she leaned on her guide. 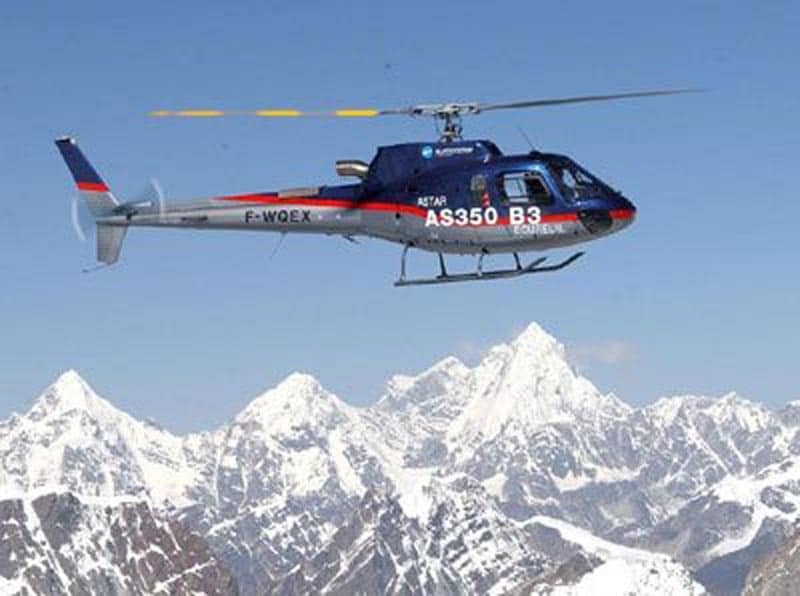 Her Everest base camp trek came to an abrupt end. It reminded us to relax because the days ahead were going to be tough. We awoke earlier than usual that day. A G Adventures and Intrepid Tour had checked into our lodge and we didn't want to have to compete for service or breakfast. We also didn't want to have to wait in line for the bathroom. 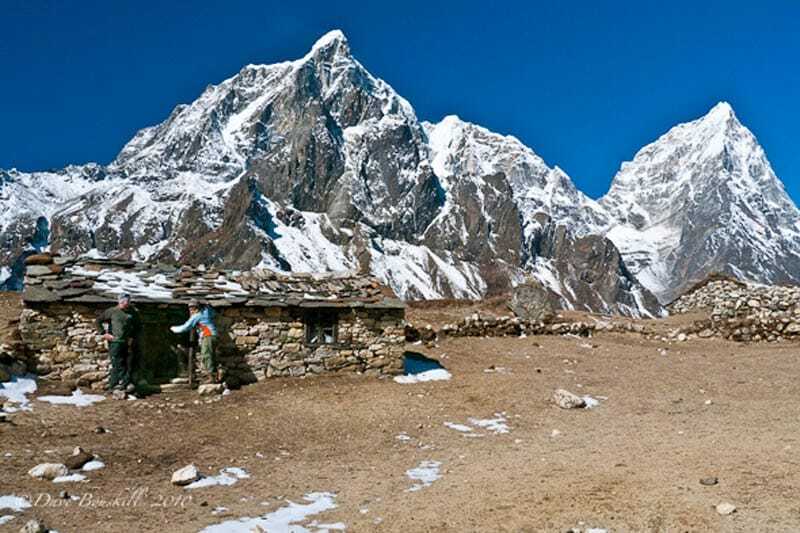 Lodges become more and more sparse as you go higher on the Everest Base Camp Trek and fewer toilets are shared between more people. Up until now, we hadn't encountered crowds of people. It had been pretty quiet on the mountain and we liked it that way. Luckily, we were a day ahead of tours. They had to stay in Namche Bazaar for an acclimatization day. So we moved on, free from crowds of people for now. Today was another difficult day making our way to Everest, but we felt stronger as our bodies adjusted well to the altitude. While the climb was steep, we didn't feel nearly as tired as the climb into Namche Bazaar two days ago. Surrounded by astounding panoramas of the Himalayas the day is exciting and exhausting at the same time. 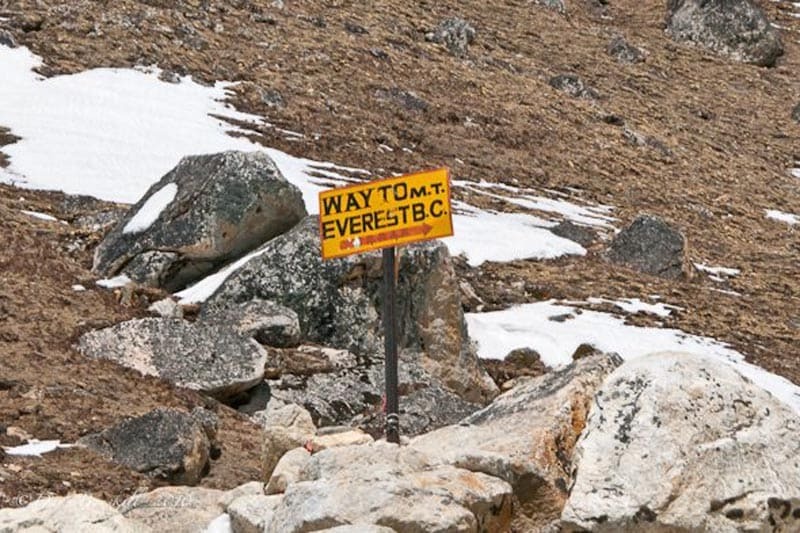 The trail is well maintained on this portion of the Everest Base Camp Trek. That is because of the effort and work of Pasang Sherpa. He has been maintaining this trail for over 40 years and has done a fantastic job. He takes donations from trekkers to pay his workers. We learned that the government doesn't provide funding for the trail to Mount Everest. It is the efforts of people like him that keep the trails in the shape they are today. 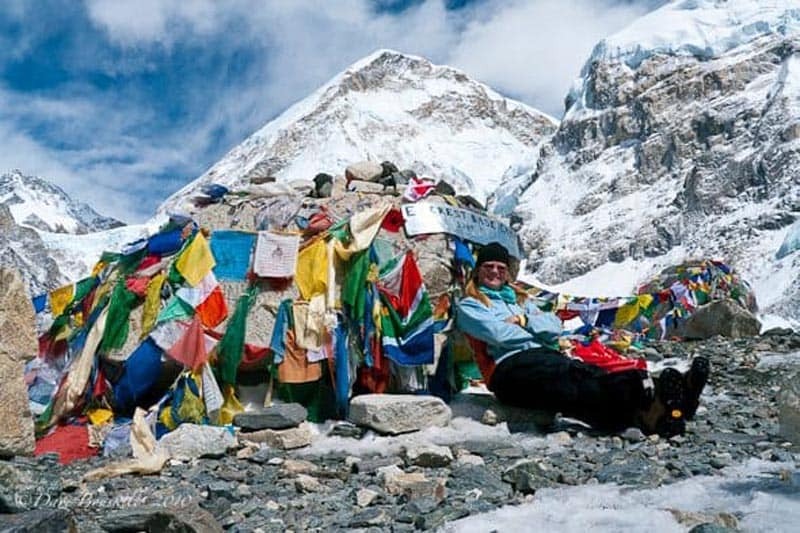 His donation booth is located just a little past a monument set up by the Norgay family honoring Tenzing Norgay Sherpa and all the Sherpas that risked their lives for Everest. They are the unsung heroes of Mount Everest. 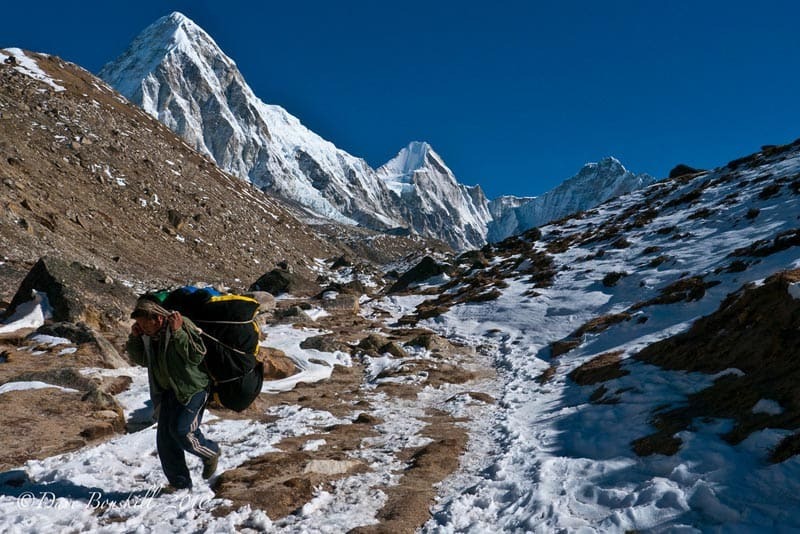 Sherpas carry the heavy loads, set the ladders and ropes and take care of setting up camp while climbers and trekkers catch their breath and try to survive life on the worlds tallest mountain. We can't imagine this work. It looks difficult and dangerous. Stacks of stones are laid upon one another building a retaining wall. Men are perched on the edge of the mountain as they do their work and face the danger of plummeting into the depths below. 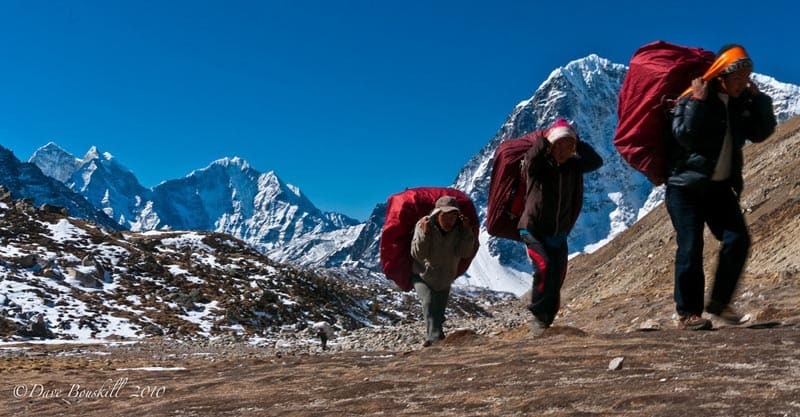 Sherpas and porters are very different. 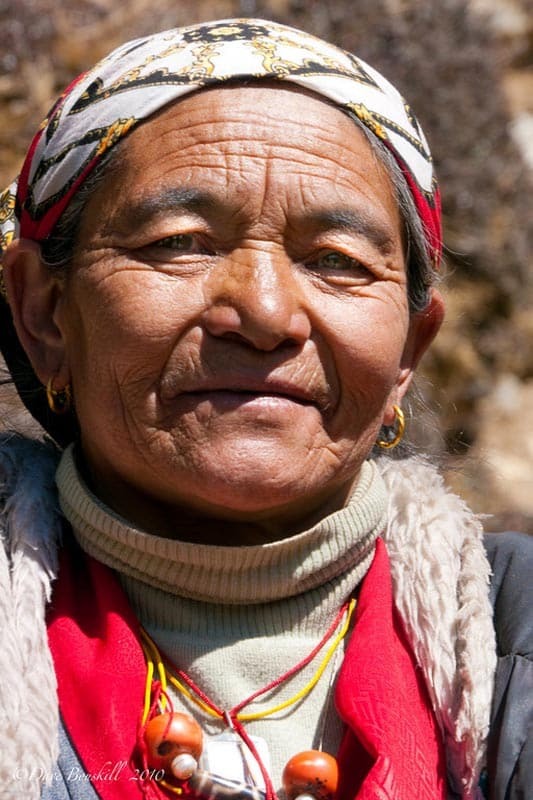 We learned that a Sherpa is actually the name of an ethnic group from Tibet. 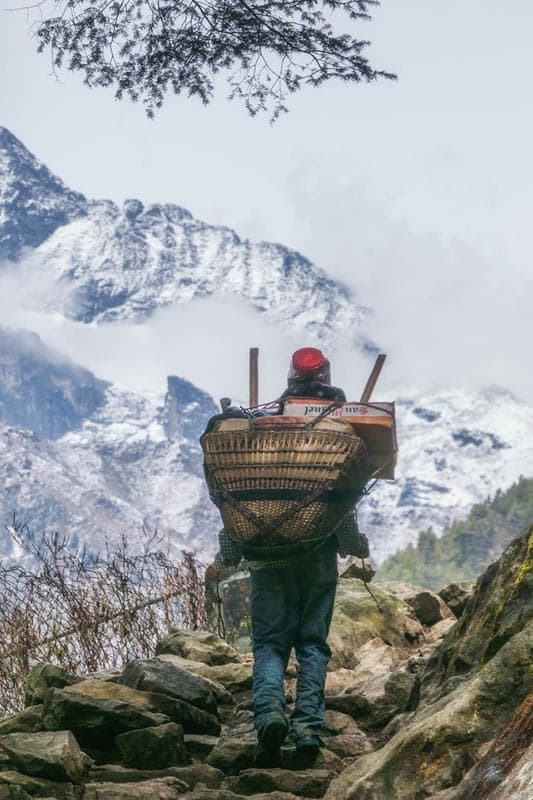 The original mountaineers used Sherpas as their guides in the Himalayas and the world has now adopted the name for porters in the Everest region. 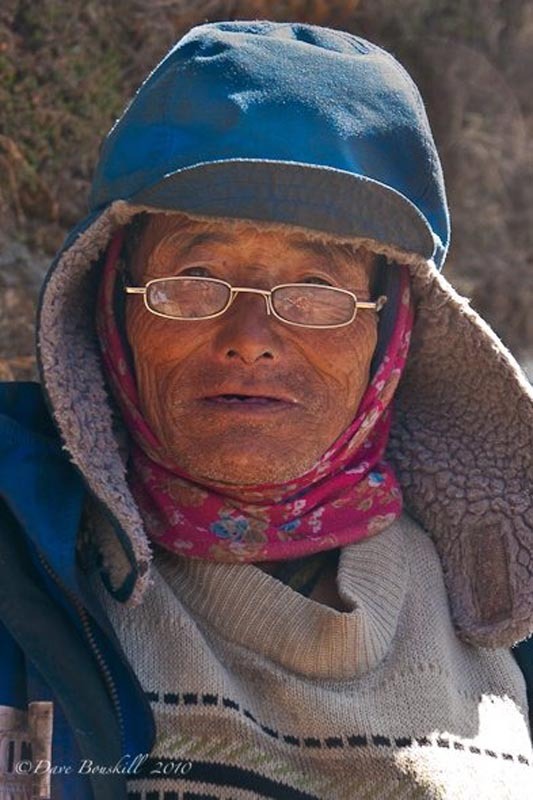 If you aren't born into the Sherpa ethnic group, you cannot be called a sherpa. 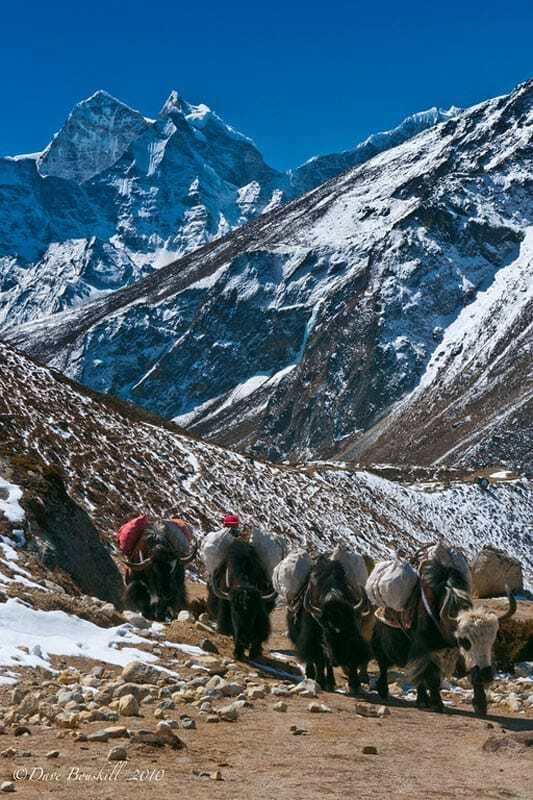 Porters are porters and Sherpas are Sherpas. We made it into our camp at Tengboche by 1:30 pm and had the entire afternoon to ourselves at 3900 meters. The final push was once again a steady 2-hour steep climb. We put our heads down and huffed and puffed our way up. We didn't stop for any photos or video and were surprised to cut the climb down to just one and a half hours. We reached the prayer wheels of Tengboche just in time for a light snow to start falling, and were happy we beat the heavier snowfall to come. The snow fell all afternoon and the temperature dropped dramatically. We warmed our feet with our new down booties that we bought at Namche Bazaar and changed into some dryer clothes before heading off to see the monks chant at Tengboche Monastery. Our guide Dipendra tells us that this is the most important monastery in the Mount Everest region. 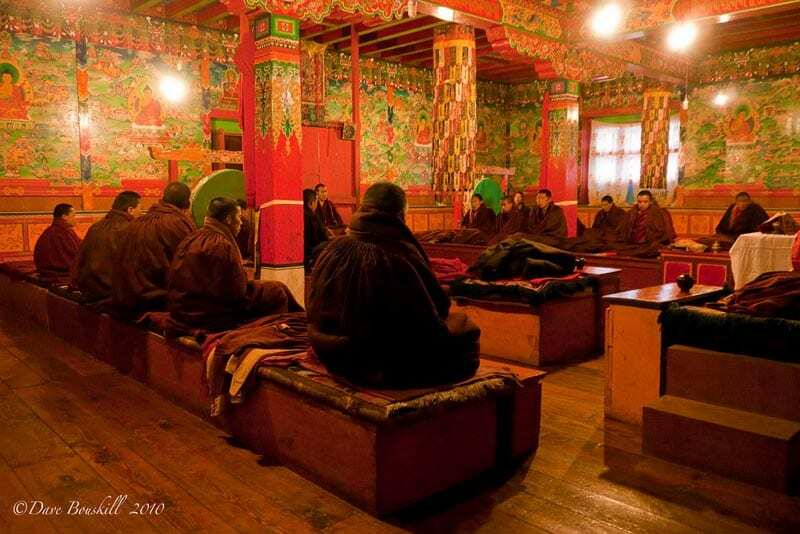 All climbers summiting Everest stop at this monastery to be blessed. The footprints from Lama Pagna Dorje from the 16th century are embedded in solid stone in front of the monastery. It's a place where he mediated as he raced through the Himalayan Mountains riding the wind with his mind. 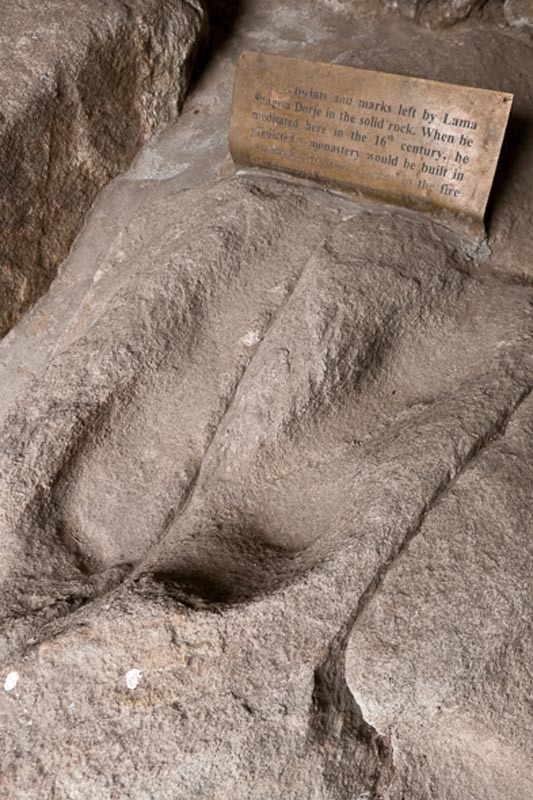 Apparently, he sat on this stone for so long, his feet left their mark. He spent years traveling the world through the power of his mind. We believe the story. Especially after our yoga experience in Goa India. He predicted that a monastery would be built here and surprise surprise, here it is. The view was magnificent. The valley is wide and opens up to massive rolling hills giving way to the highest peaks on earth. And yes, Mount Everest is part of that view. The snow makes it that much more beautiful here. At this higher elevation, the tea houses are very basic and rustic. 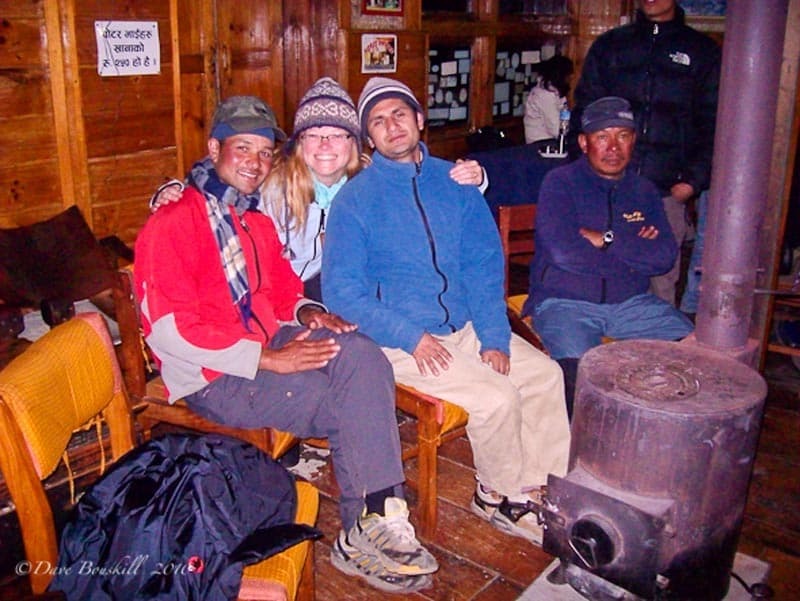 We felt like true adventurers as we sat by the fire warming our feet and swapping stories with other trekkers by candlelight. There are 10 of us staying in this tea house sharing electricity to charge our camera batteries. When we went to bed, our rooms were freezing. They are not heated. The temperature easily dipped down to -10 Celcius and our plywood walls didn’t offer a lot of comfort. We tossed and turned all night long. 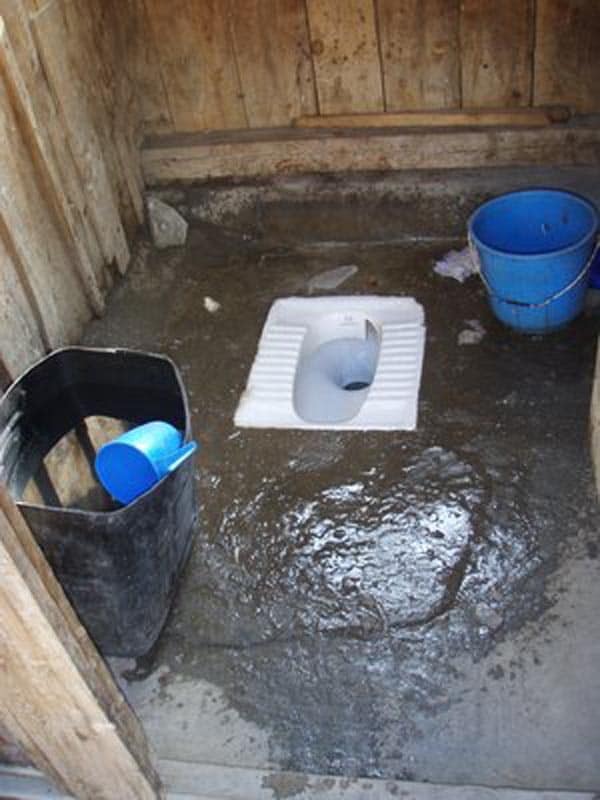 It was so cold the scoop bucket for the shared squat toilet froze over forming a patch of ice to form on the floor. It was a slippery trip to the outhouse. Sadly, we always have to pee a lot during the night when sleeping at altitude. We realized that we should have paid the 250 Rupees for a hot shower at Namche Bazaar on day 3 because now the weather was so cold there was no way we could face a bucket bath in a freezing shed. Dave and I set a new record on the Everest base camp trek, 9 days without a shower! People do well here and they respect the tourists because the tourists are what keeps them going. Towns function well up here in the mountains. The Nepalese are a strong bunch. They smile and say Namaste (hello) and they talk on their cell phones and listen to music. All this while climbing uphill towards the tallest mountain in the world with giant over-sized loads on their backs. It was freezing! Morning came too quickly on the Tengboche leg of the EBC Trek. 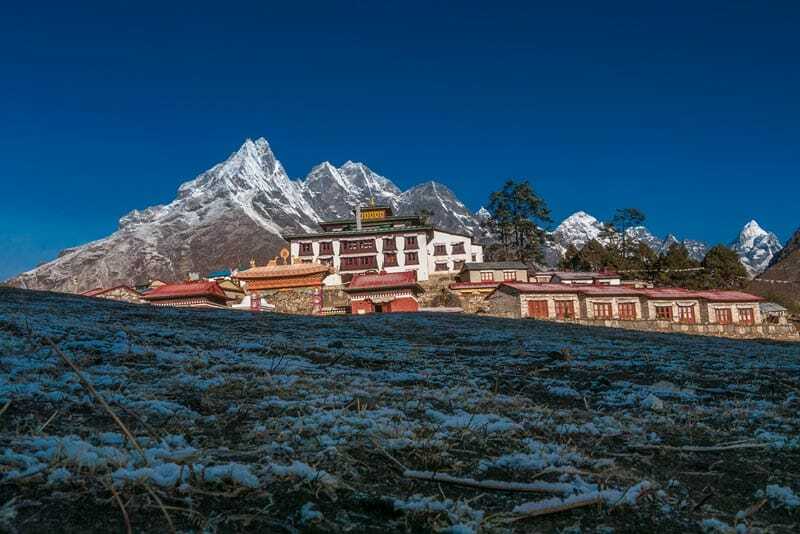 But, we awoke to fresh snow at the Tengboche Monastery and clear views of the Mount Everest and Lotse peaks. Today we walked to higher altitudes and saw our first trains of wooly yaks. 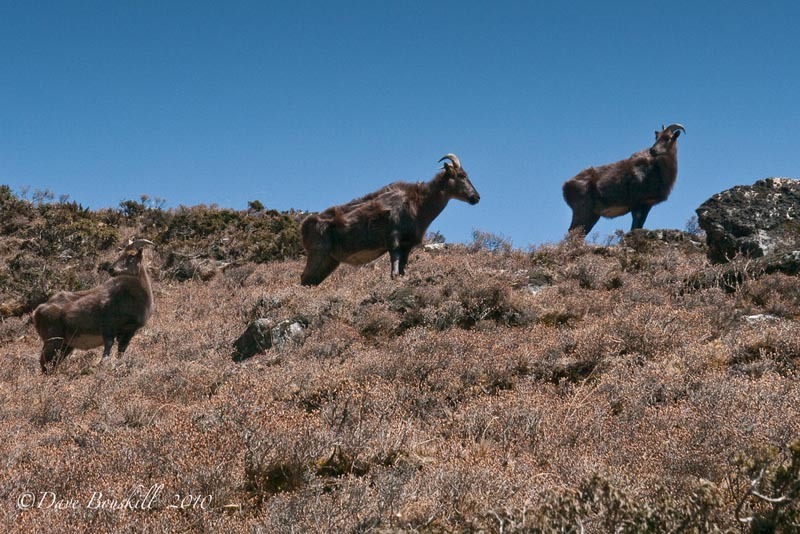 Yak can't survive at low altitudes because it is too warm for them, so you don't see them until at least 3000 metres. They are beautiful. Signs of expeditions going up to summit Everest go by as large groups of yaks and people carry giant loads of gear. 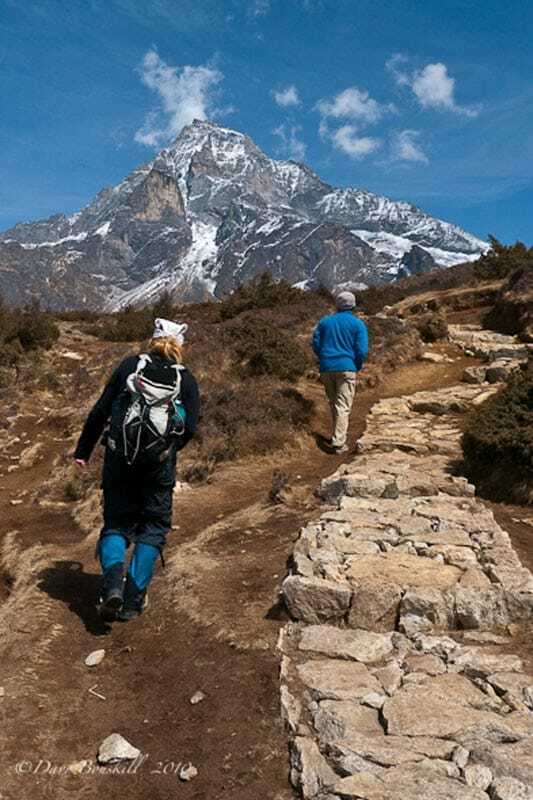 It is exciting to think that we were walking the same trail as so many great mountain climbers, like Sir Edmund Hillary and Tenzing Norgay Sherpa. We talked to two people whose companions had to go back down due to symptoms of altitude sickness (AMS). A rescue helicopter flew overhead and we heard stories of people being choppered out regularly. A fellow from Norway told us of a family that was rescued by helicopter. $6000 later they were safely down at a lower altitude and feeling better. Luckily, we don’t feel in any danger at this point. The trails are excellent and we take it slow and steady each day. I was glad we packed Tang for our water. It made it taste better, keeping us well hydrated. We didn't really want to drink just water, but the Tang was actually delicious. I highly recommend using Diamox tablets as well. We met so many people suffering from headaches, dizziness, and fatigue and they weren't taking anything. We've always used Diamox when climbing to altitude and it has worked beautifully for us. 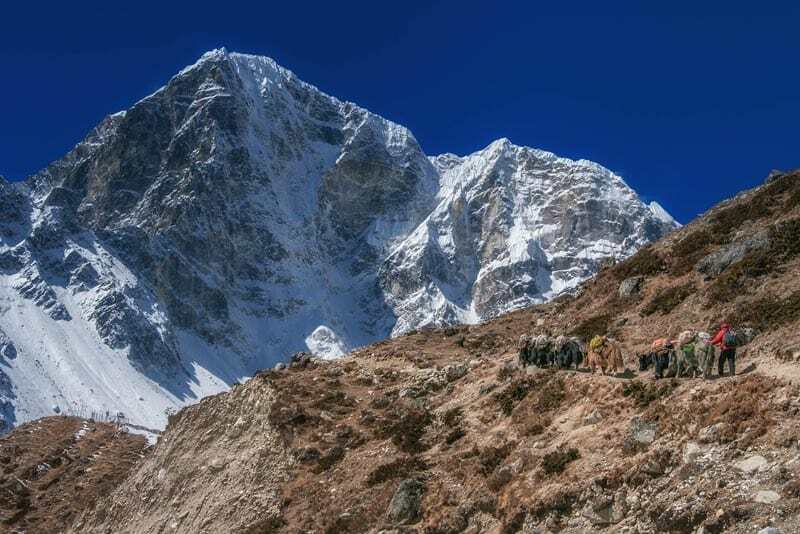 The Everest Base Camp Trek is no exception. Body aches and pains have popped up from carrying our backpacks. The old shoulders are a little stiff each evening and the beds aren't the most comfortable, so a little ibuprofen has helped to take the edge off. Oh and chocolate soothes any pain. Lots of chocolate. 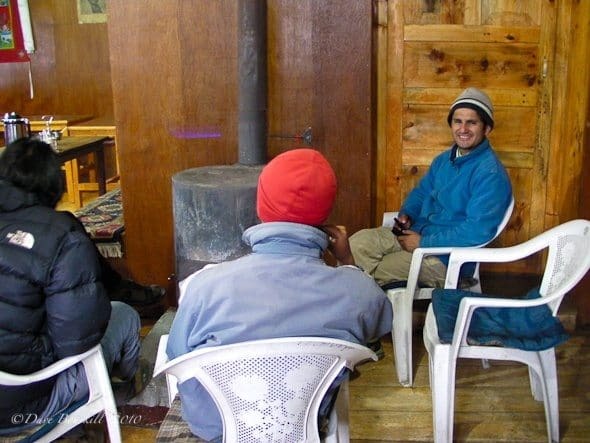 As we sit around our wood stove burning yak dung, (there aren't trees at this level and the Nepalese burn dried yak dung to keep warm) we enjoy talking about hockey with Martin and Richard from Slovakia. We have spent the past two nights with them. 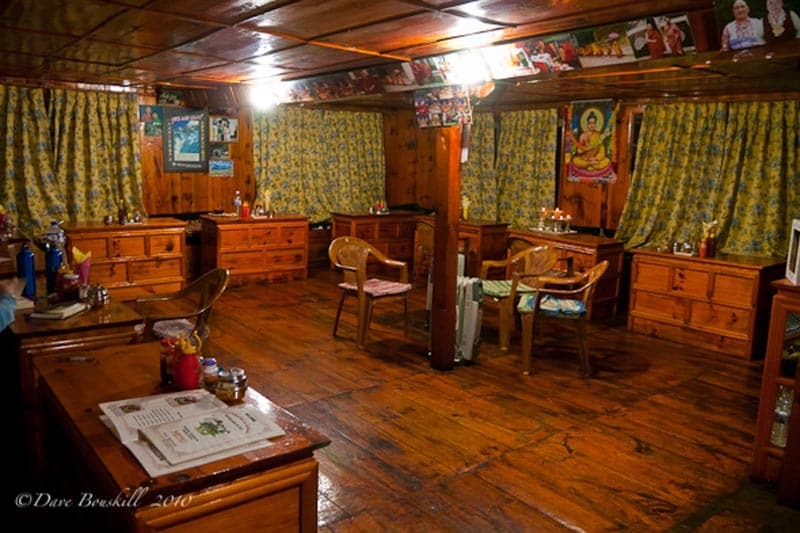 Each guest house on the EBC Trek has been quiet and comfortable, with only one to two other parties climbing. We have been lucky; we only see a dozen or so people on the trail each day, and the yak trains have been few and far between. In a couple of weeks that all will change. Soon it will be high season and the trails will be packed. The snow from the night before made for more incredible views. As we started out from the lodge, the sky was crisp and clear, showing Mount Everest in all its glory. It was stunning, and in between gasping for air, we admired the view. 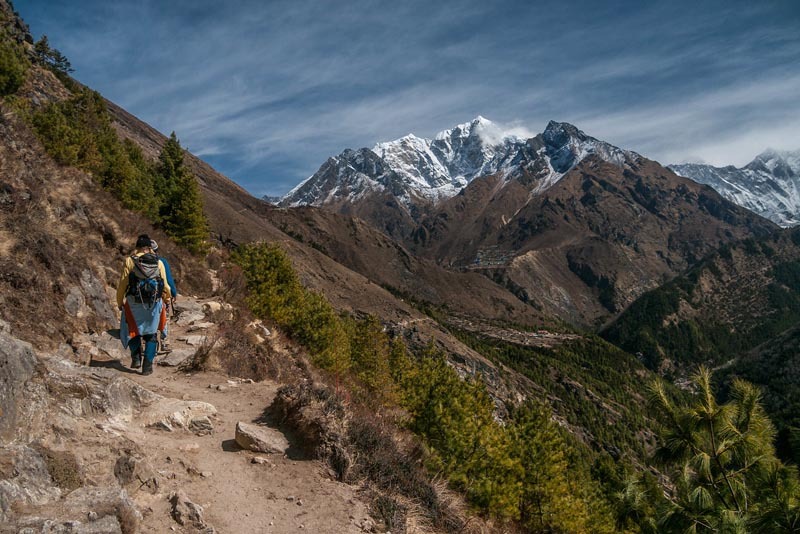 The trek from Tengboche is breathtaking (literally). I conquered what little fear of heights I had left this day. Some of the narrow paths drop sharply into the deep valley below. Soon we found ourselves walking along the ledge not thinking at all about the dangers below. Woolly yak trains were more frequent and we had our system perfected to give them the right of way without letting them nudge us off the mountain. 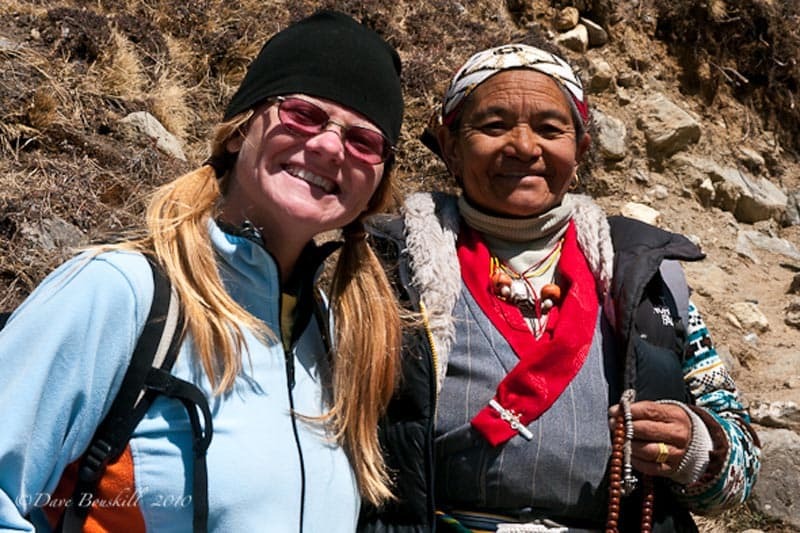 After a tea stop in Pangboche, we met a sweet lady that walked with us all the way to Dingboche. Her name was Yangshou and she waited for us as we struggled up hills and crossed suspension bridges. 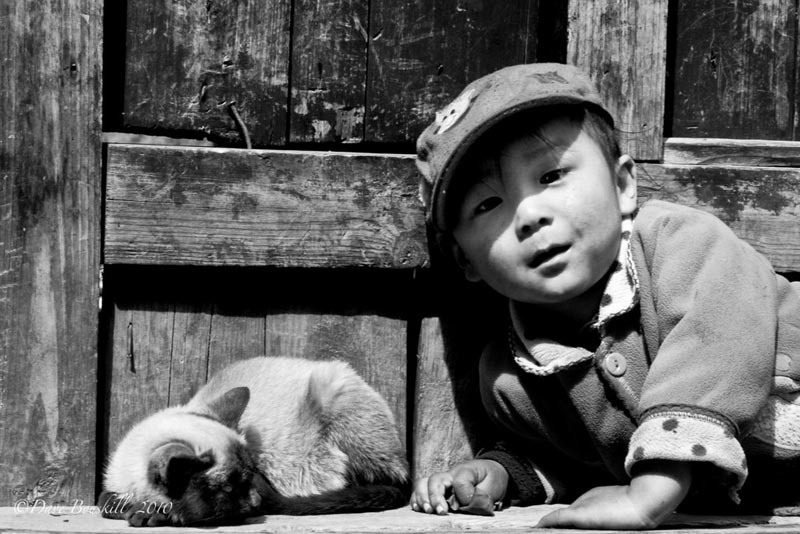 Deb and our friend Yangshou! Her cute laugh and quiet prayers helped to pass the time. She stopped to talk to everyone on the trail while we plugged along. She fell far behind when she chatted with friends, only to quickly catch us and then scoot by with ease. She'd then wait on a ledge while we caught up. She must have enjoyed our company because we really slowed her down. When we got to Dingboche, we parted ways and never saw her again. Yangzhou, we will always remember your smiling face when we think of our time on Everest. People started to feel ill this morning on our Everest Base Camp Trek. 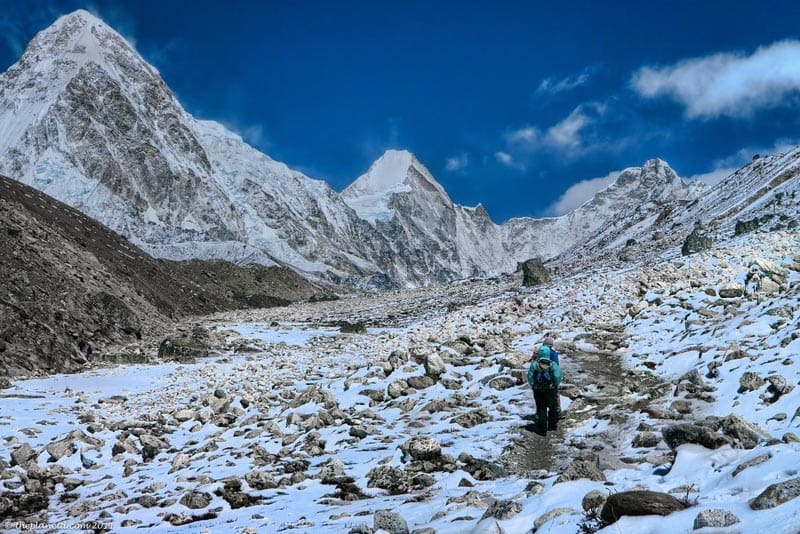 (which we forgot in Kathmandu and kicked ourselves about it everyday) we would have realized that we should have taken an extra day to acclimate in Dingboche. Lucky for us, we felt strong, but other groups were complaining of headaches and dizziness. We walked with Martin and Richard from Slovakia during the morning hours. They carried their own packs and after watching them struggle, we were happy we hired a porter. We enjoyed our day taking photos of the stunning clear views of the Himalayas. 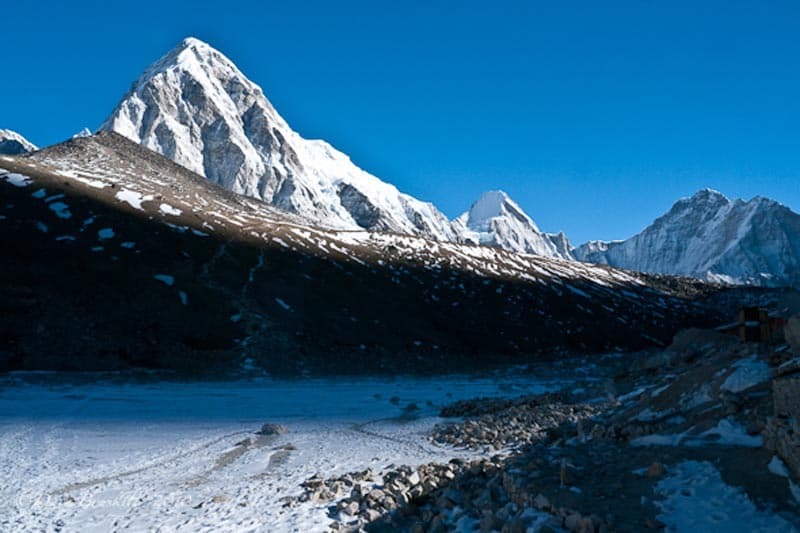 It may be a little colder trekking the Everest Region at this time of year (Early March), but the skies are clear and blue. We had a front row seat to some of the best views on earth. An entire panorama of the mountains standing proudly overhead, reaching up to the deepest blue sky that I have ever witnessed. The Himalayas are astonishingly beautiful. The scene took our breath away. The mountains looked more imposing with each corner we turned. Hobbits on the Everest Base Camp Trek? When we came across a small cluster of houses, we felt like we had entered the Kingdom of Middle Earth. Little Hobbit houses lined a valley with giant peaks looming overhead. We had to knock on the door to see if Bilbo Baggins happened to be in. Sadly, he wasn't home. I ended up singing Leonard Nimoy's Ballad of Bilbo Baggins for the rest of the day. A bad idea since I only know a few words. 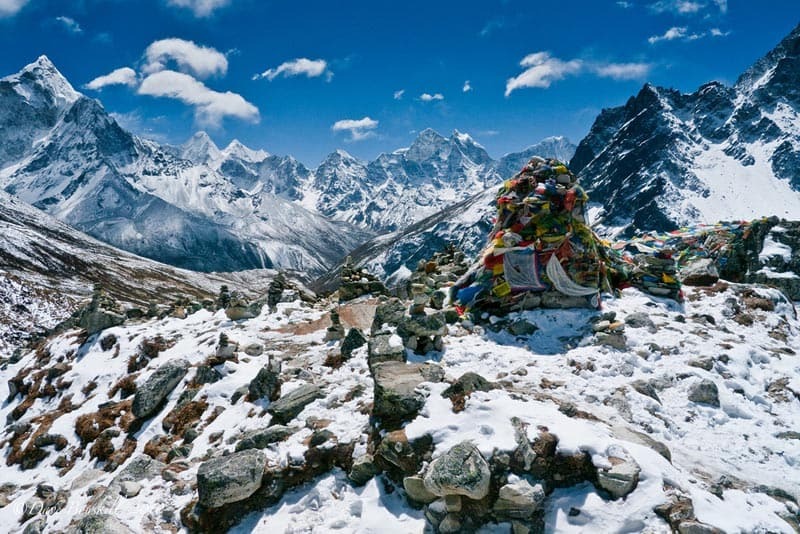 Weather varies on the Everest Base Camp trek. The wind picked up and we put on our outer layers for the first time. We were thankful to have them as we staggered through the high gusts. After lunch, we faced quite the scramble up a steep hill littered with boulders. It looked like a tough climb, but we moved with ease and quickly made it to the top. Where we found our strength, I do not know. At the top of the hill is a very moving site. 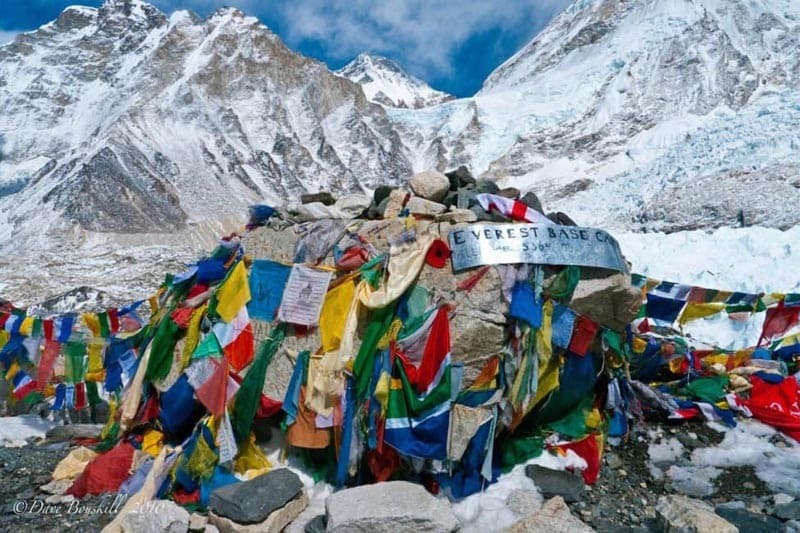 Several monuments and stupas are erected, honouring Sherpas and climbers that have lost their lives on Mount Everest. The most notable of these is Babu Chiri Sherpa, the former world record holder of the fastest ascent of Everest, the most number of ascents up the mountain, and the quickest back to back summits of 2 in less than 2 weeks. He tragically lost his life on his 11th attempt when he fell into a crevasse. It was a moving experience and a strong reminder to not take things lightly on Mount Everest, even if you are only trekking to Base Camp. It is still a serious trek. How Are We Feeling at 5000 meters? I have been suffering from a cold since India, and it seems to be intensifying with the increase in altitude. Every morning my cough is worse and my nose is stuffed up to the point of being unbearable. Dave has suffered his first symptoms of altitude sickness. He has a slight case of diarrhea and is not happy about having to wait for the toilet in the teahouses. It was a slow climb to Gorepshep. We stopped regularly to catch our breath and today we took more breaks than usual. Luckily it was only a couple of hundred meters in elevation gain so we made it to our guest house by 12:30. The sun was shining brightly and it was quite pleasant outside. After eating a hearty meal of vegetarian Sherpa stew on the terrace, (yes, we ate outside in the warm sun above 5100 meters) we set out for Everest Base Camp. We were lucky and had clear skies. Up until today, the clouds had rolled in by early afternoon. Today the sun shone and the skies were blue until sunset. The trek to Base Camp from Gorepshep is an easy one. It's two hours of walking with only a small elevation gain, and we made it with ease. The Khumbu Ice Fall is the first thing to come into view, and it is unbelievable to think that we are actually standing there. We were the only people at Base Camp when we arrived. We saw another group coming down on our way up, but once there we had it all to ourselves. It was thrilling. It may have been more exciting later in the season when Everest Expeditions are there, but we really liked having base camp to ourselves. There wasn't a soul on the mountain. We were also thrilled to see how clean it was. Great efforts have been made to clean up base camp over the years, and it seems to have worked. 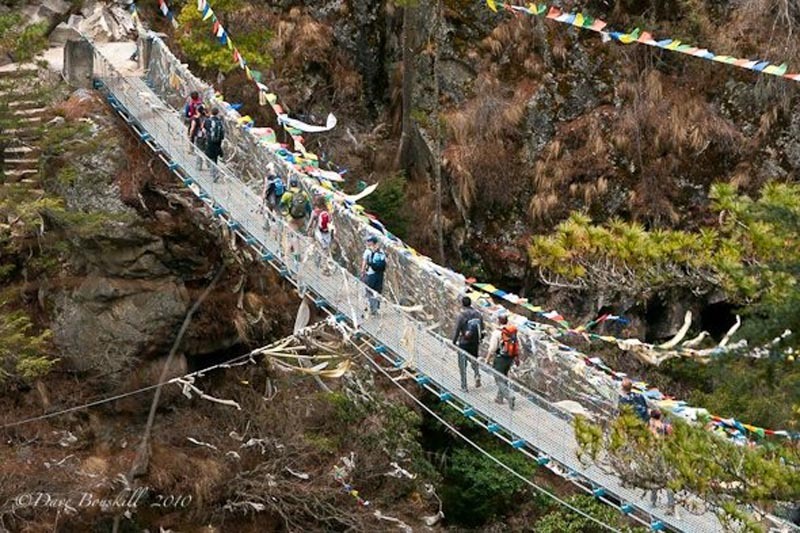 In truth, we were impressed with how clean the entire climb was from Lukla all the way on the Everest Base Camp trek! 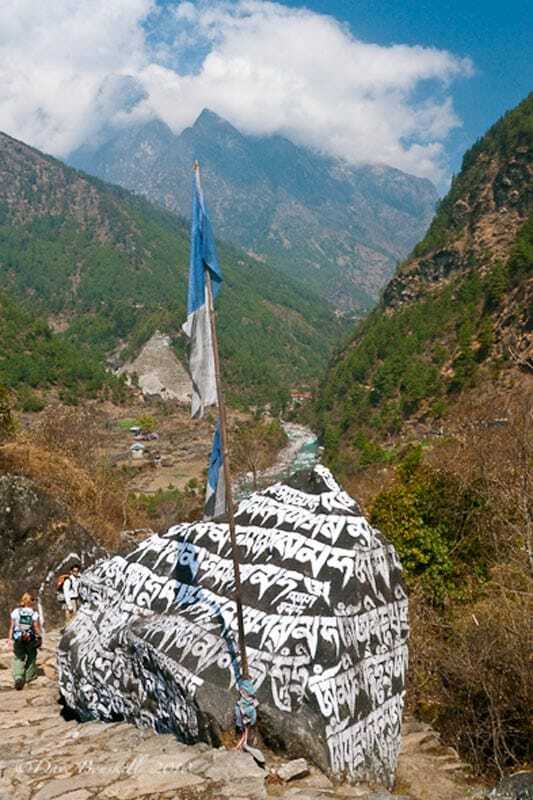 We stood at a rock covered with prayer flags announcing that yes, we had made it to Mount Everest Base Camp. We stayed for almost an hour taking video, celebrating, and snapping photos. Another single climber came along and we decided to walk back together. It was close to 4:30 and we didn’t want him to walk back alone. Even though it was an easy climb, there are narrow paths atop high ledges. Anything can happen and it just so happens that while walking back, an ice bridge broke off after I stepped on it leaving Dave with a sticky situation. He had to make a giant leap over a gorge. We made it back to Gorepshep safely but it was a reminder to never trek alone. 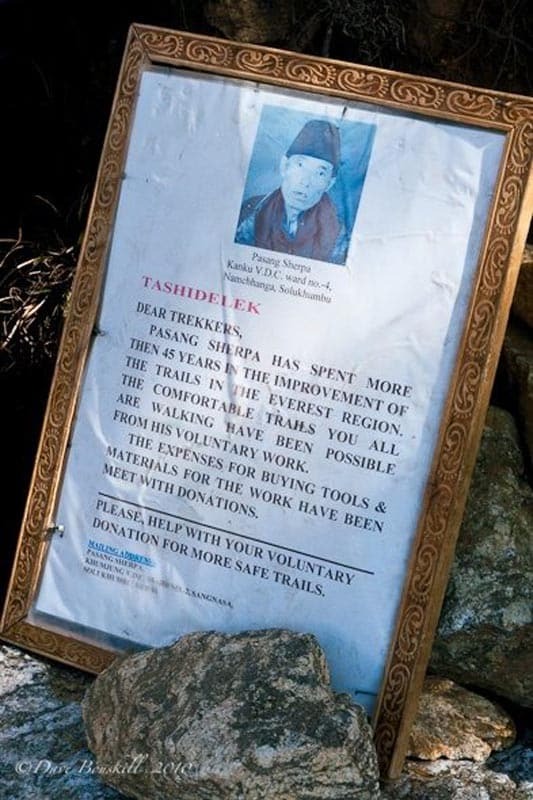 We saw signs of missing solo trekkers all over the Everest region. It may be a popular route, but there are always times when you are alone and could easily run into trouble without being noticed. By the time we made it back to Gorepshep, the excitement had worn off. We felt the same when we climbed Mount Kilimanjaro. The goal of reaching base camp is complete, but it feels a little anticlimactic. The thrill of reaching your destination is over and there is nothing more to look forward to, but there are still so many days to go. That night I had serious sinus congestion and felt like I was suffocating in my freezing bed. Our guide Dipendra brought me hot tea and I slathered myself in Vicks but nothing helped me to breath eaiser. We had planned on climbing up to the Gokyo Lakes trek but made the decision that night to end our trek and head back down. 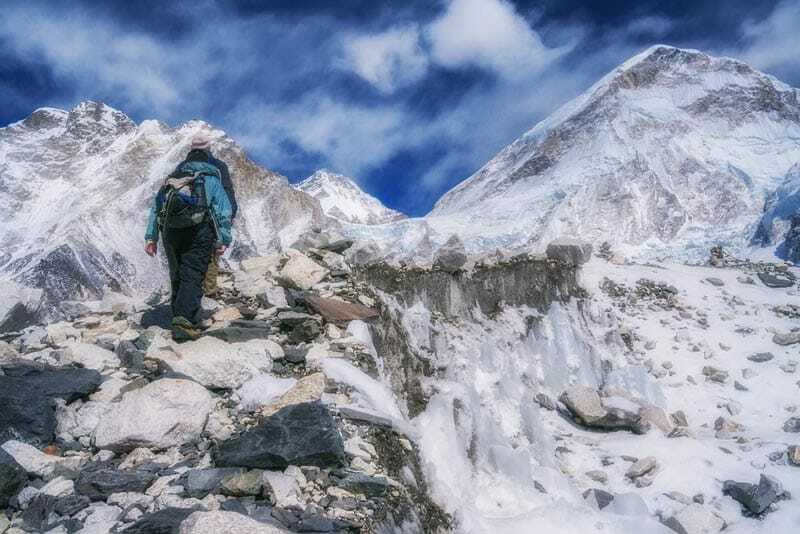 If I was feeling better in the morning we were going to do a quick detour to Kala Patthar on our way down. 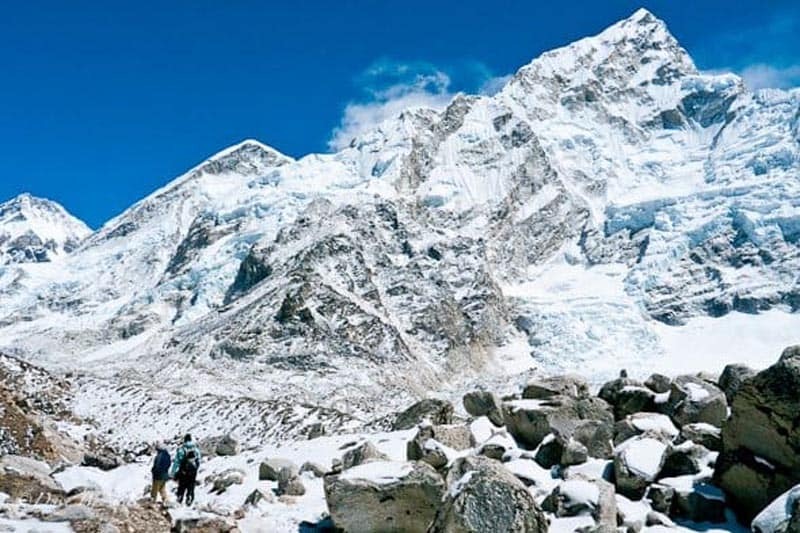 Kala Patthar is a hill above Gorak Shep that offers the best view of Everest and is a must stop on anyone's Everest Base Camp trekking route. I wasn't in the best of spirits as I didn't sleep well and my head was pounding from the pressure of congestion, so we made our way down as fast as we could. If only we could be choppered out of here. But alas, there is a long climb back to Lukla ahead. Even though we were heading down, there is still a lot of altitude gain and loss on the trek back and we had four days ahead of us. In the end, we made it to Everest Base Camp. It's an experience we'll never forget and highly recommend it to everyone. 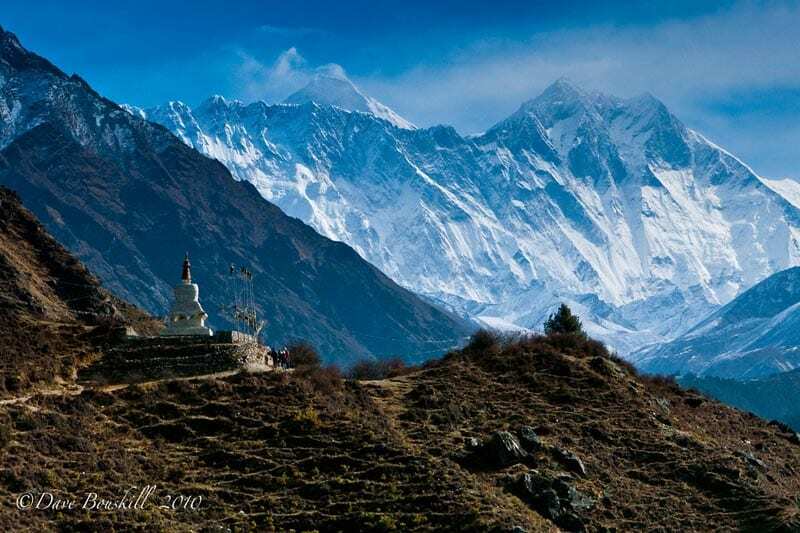 The Himalayan Mountains are the most beautiful and spiritual place on earth. A trek there will change your life. 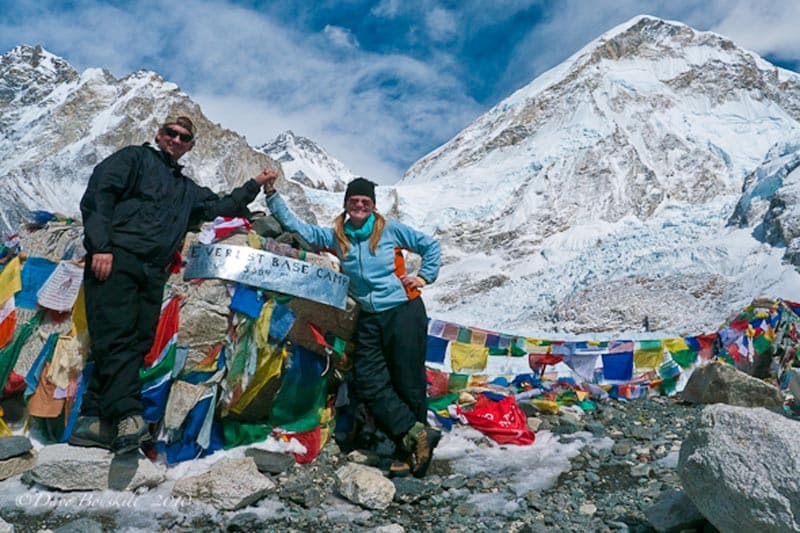 We hope you enjoyed our journey along the Everest Base Camp Trek. It is one of the greatest adventures we've ever done. We made new friends and created memories to last a lifetime. To book your own Everest Base Camp Trek, check out our friend Dipendra at his company Simrik Real Nepal. 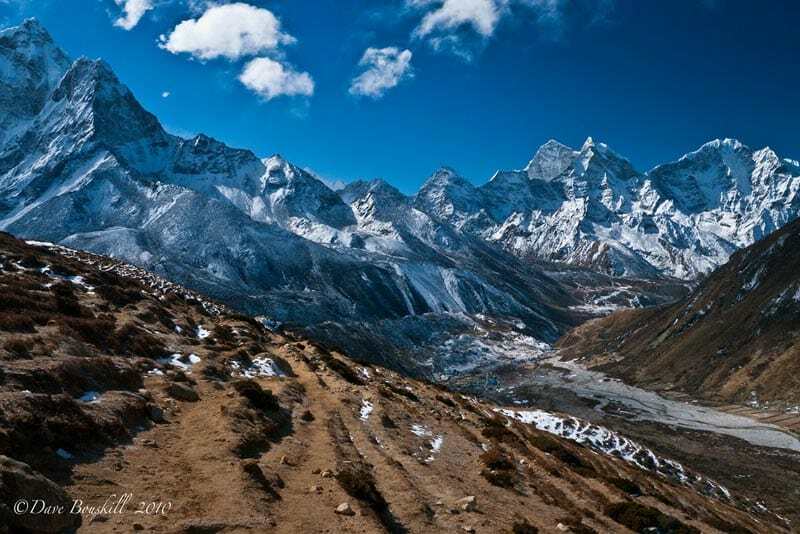 31 Responses to "Everest Base Camp Trek – All You Need to Know from Start to Finish"
Such an awesome post with amazing pictures. Thanks for sharing your experience with us. 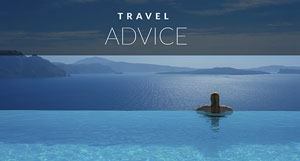 It’s an informative post and I was thinking how you backpack for the weather? There are many things that somewhere can’t be cope at altitude like a sickness. I remember I scare when I attempt sky diving in Dubai. It’s was a wonderful experience but I have a fear of altitude places. I have read about it but never tried. I am glad that at least i am reading such an informative article that clearly shows experience of treking over there. It might so much exciting and filled with happiness because seeing something like that would always be more of fun and achieving some of our own. Would love to try it once for sure! Hi guys. Nice blog. Very informative. I just wonder, how did you prepare for the weather? How did you acclimatise so that you can cope with thr danger of altitude sickness? It is the ine thing that scares me to try to trek on high altitude places. To climb Kilimanjaro and to reach the EBC are in my bucket list. I’m hesitant because of my fear that I might die from cold temperature and altitude sickness. Dress in layers, and drink plenty of water. You will want to bring DIamox with you and take it. 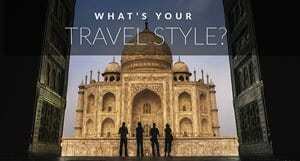 You can get it in Kathmandu, or go to a travel clinic before leaving home. You won’t die from cold temperatures at Base Camp if you have a proper guide, and dress properly. 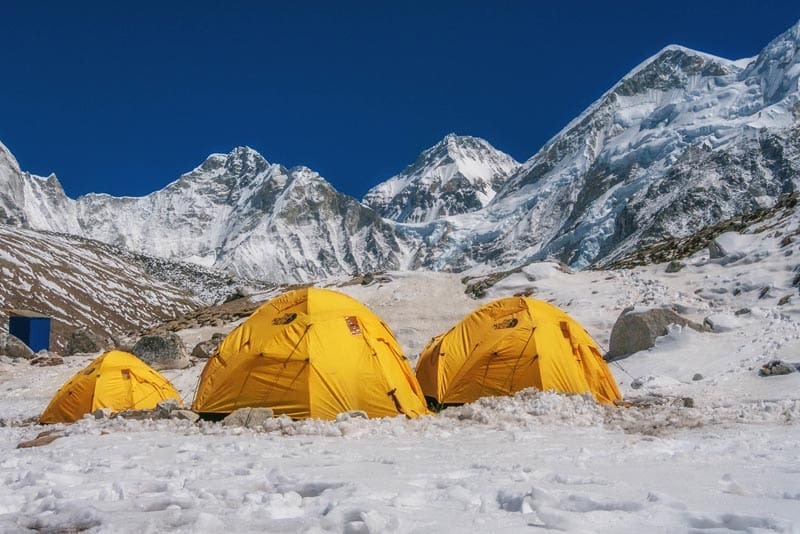 The real dangers are if you are summitting Everest, that’s when you can get into problems, but Base Camp is very doable for anyone that is physically fit. If you don’t have the gear, you can buy winter coats, boots etc in Kathmandu. But we do recommend breaking in your boots beforehand, so you should buy those before you leave home and wear them a lot. Get warm, waterproof breathable boots with wool socks and bring several pairs. Loved reading all your posts, some really good insights here into EBC! You mention putting your hair in braids, why is that? Is it because of the sweat? Is it windy so it gets knotted up? 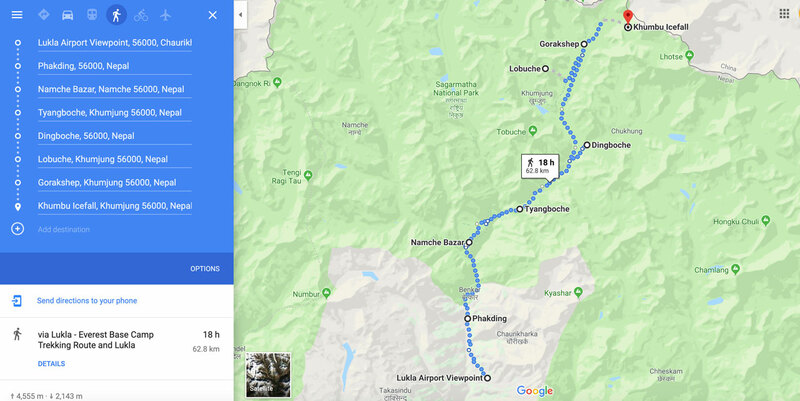 Just curious as I am doing this trek in a week and am open to all tips ? Yes, hair can get really matted due to wind, dryness and lack of showering. The Braids kept it from matting up like dread locks. Have a great time! Long hair can get very matted almost like dread locks. It’s becuase there aren’t a lot of chances to shower after Namche Baazar, the wind, sweat and dryness from altitude really takes its toll on both hair and skin and the braids, keep the hair from matting and breaking off. Great read! Just curious. what time of year did you go to avoid the masses of tourists? Thanks for sharing articles and videos it will be helpful to all people those wants to go Mount Everest. 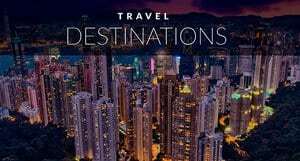 This is just amazing and knowing each and every experience that we will have while travelling is another aspect that made me read this article fully. I am in Dubai now on a trip and would surely try to visit this place i could. I should consider the right time and other things roo. I must thank you for this wonderful piece. Such a great journey you have shared from start to finish and your presentation is also impressive. I would love to follow these things when I will go for a camp tour. 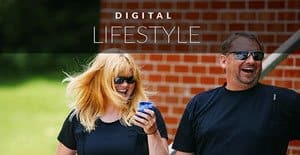 Your Video is superb, I feel your treking experience in this article. worth to read it. Wow what an wonderful place is this. Want to trek this place in my life. Great article, thanks, surprised at the early time of year you did the trek, but sounded ideal – any other good write-ups or links discussing the pros and cons of going in the spring vs fall? …weather, landscape, crowded w/ other trekkers, festivals, etc Thanks! I am looking forward for this kind of base camp. What an excellent post!! Thank you so much for an informative article and personal feel. This is very helpful and inspiring for my upcoming trek to Everest Base Camp. There is so great view in pictures.it’s useful and helpful for the trekkers .i like these types of views .and tourist are also love these types of views. Anyways amazing photos and love the videos! really gives you a feeling how it is there and must be just thrilling. Looking forward to read more about your travels. 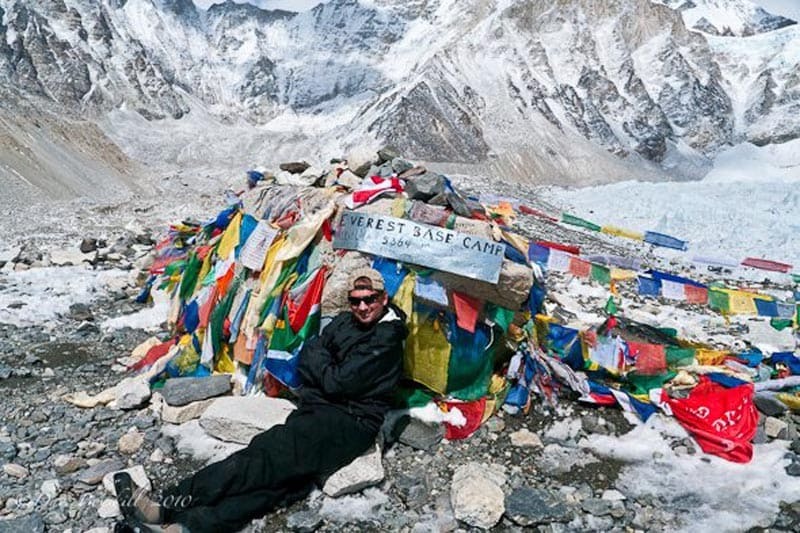 Nice Articles and sharing a good details of Everest base camp and amazing photos. I will try to go this year Nepal and go to Everest Base Camp. Great post. I am doing the Everest Base Camp trek in October. I completed the Annapurna Circuit in 2012 and loved it. Nepal is a such a lovely place and the people are amazing. Thanks for sharing! Wow congratulations on your trip and everything looks really cool. I would love to do the same! Did you train a lot before you went there? Did you prepare physically? I don’t know how fit I have to be to be able to take on such a travel. Anyways amazing photos and love the videos! really gives you a feeling how it is there and must be just thrilling. Looking forward to read more about your travels. Hi Marus, we didnt’ train a lot before. We were traveling a lot though. Before heading to Nepal we spent 4 months traveling Sri Lanka and India. We did a yoga retreat and a lot of hiking and walking, but we didn’t do any proper training. We were in relatively good shape. It’s mostly just a long uphill hike. The difficulty is being at altitude for a sustained amount of time. It affects everyone differently. Some people can be in tip top shape, but not do well at altitude and vice versa. So, it’s best to take it slow and steady, drink plenty of fluids and pay attention to how you are feeling. All your photos are simple awesome and your posts are speaking a lot of useful information. Thank you for sharing this article. Thanks for your beautiful video. I fell a little up lifted seeing this. I believe one of the prayer flags is for a lady I knew. Inspiring. I wish I would have done adventurous things like this when I was young. Young people don’t put off adventure. I’m glad I read this. This is something I have always wanted to do but have been a little nervous to think about doing it when the climbing season is in full swing. The time of year you went and the company you chose make a lot of sense! Thanks for sharing. The views are amazing!! 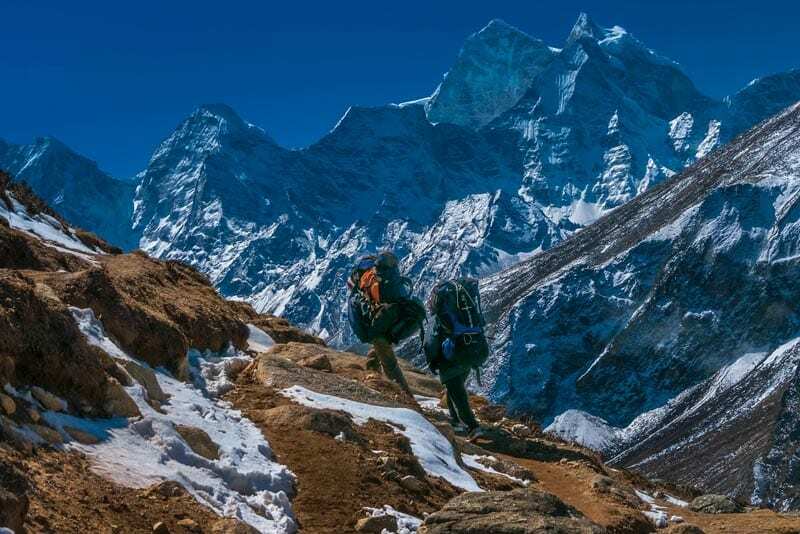 I love adventure, but I would definitely need to build up my stamina to do the Everest Base Camp trek. It looks like it was an awesome experience for you! Wow, what a beautiful experience. Your photos are amazing! Amazing! Can’t wait to check this off my list!